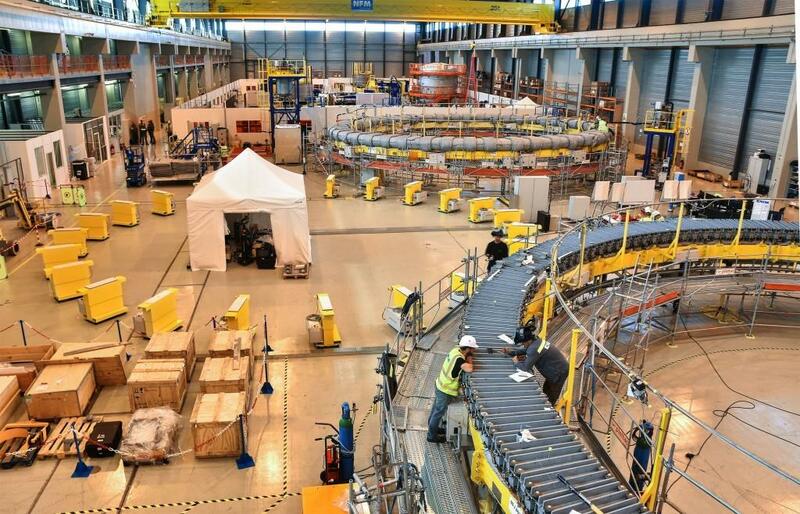 Winding activities have begun on PF2—the second of four coils to be produced by Europe in this manufacturing facility on site. 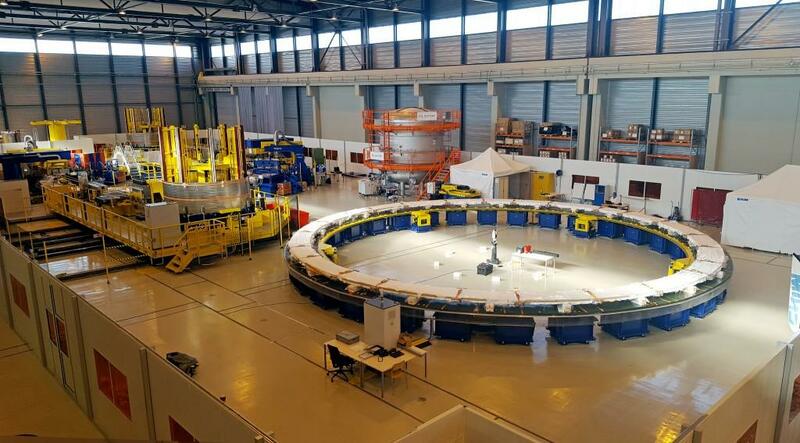 With a few adaptations, the equipment set up to wind the first production coil, PF5, can serve again to wind the double pancakes required for PF2, as both coils measure 17 metres in diameter. 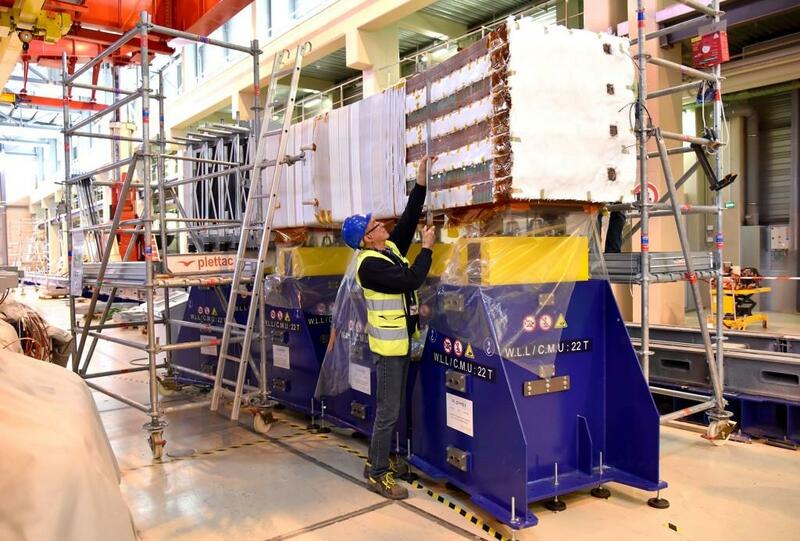 This "piece" of mockup coil faithfully mimics poloidal field coil #5 (PF5) and its eight stacked double pancakes. 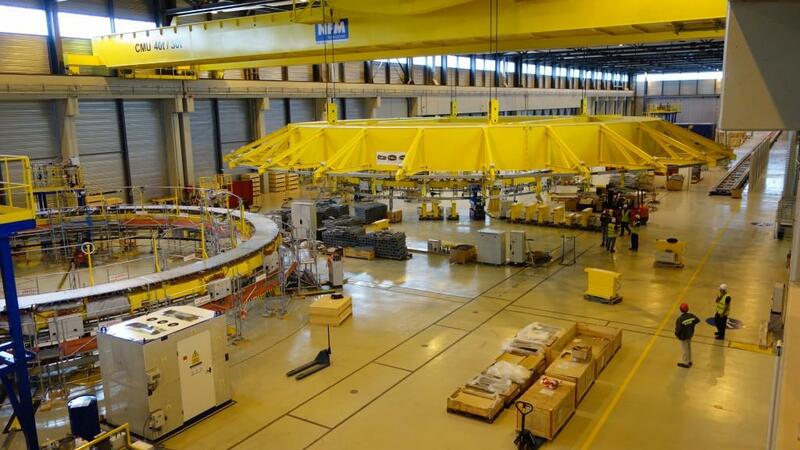 The winding pack impregnation operation will be tested first on this mockup before being carried out on PF5. Impregnated double pancakes are stacked and joined to form the final coil. 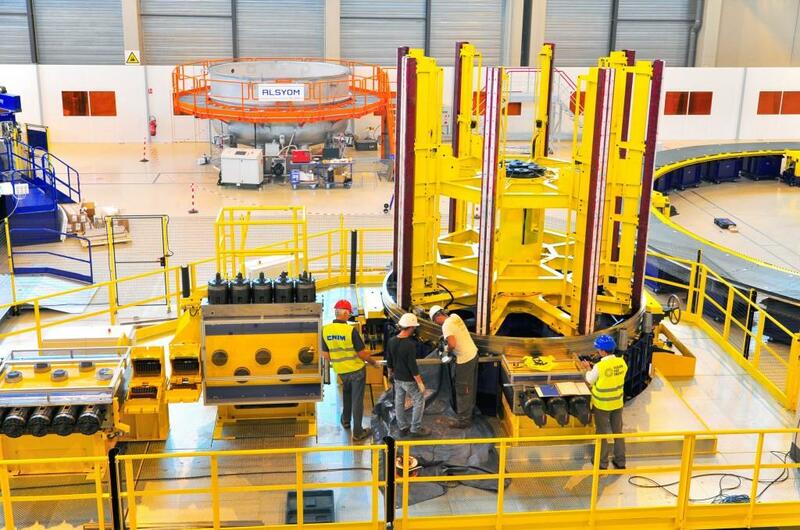 Here we see five of PF5's eight double pancakes stacked, as well as intra- and inter-pancake joints for helium flow. 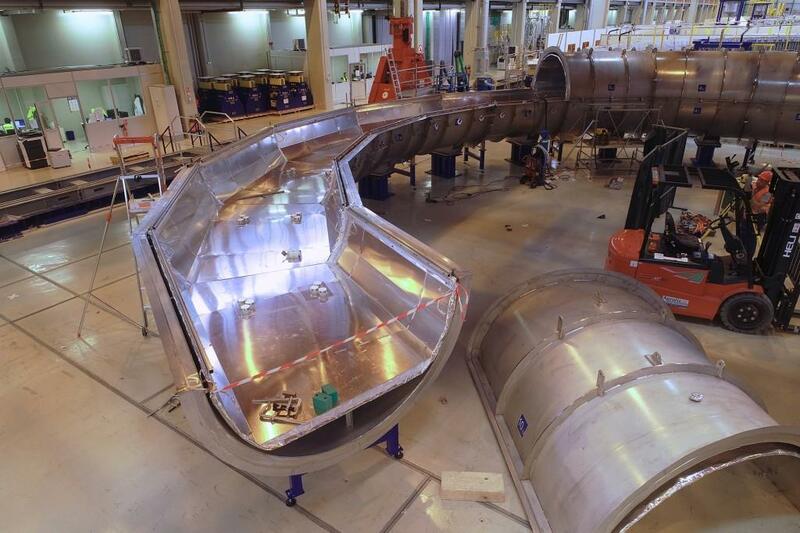 Two cryogenic chambers are being assembled for the final stage of fabrication—cold testing at 80 K, which will permit contractors to test the behaviour of the completed coils under thermal constraint. One chamber will serve for PF5, the other for PF6 (manufactured in China on behalf of Europe and delivered at the end of 2019). 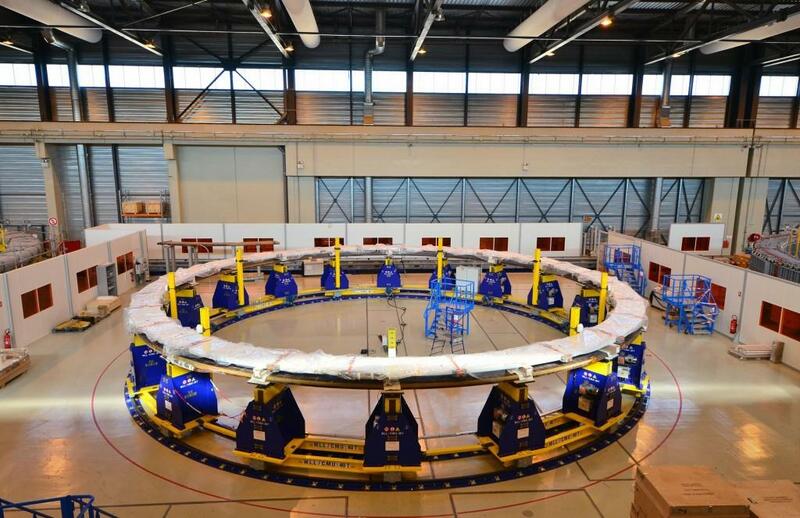 Beginning with conductor winding and ending—at the other side of the 257-metre-long facility—with final assembly and cold testing, the fabrication of ITER's ring shaped magnets is a precise step-by-step process. Two spools of niobium-titanium conductor are simultaneously fed onto the winding table to create a double pancake (a double layer of spiralled conductor.) 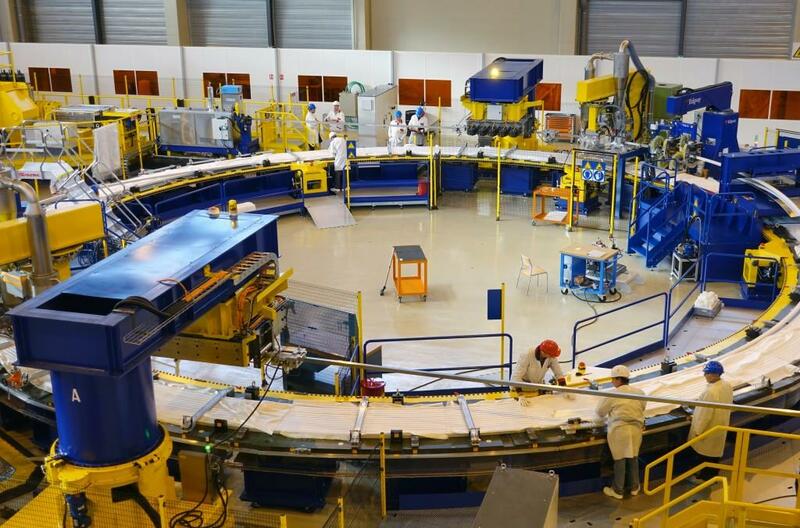 The winding table in the picture is dimensioned for PF5 and PF2. 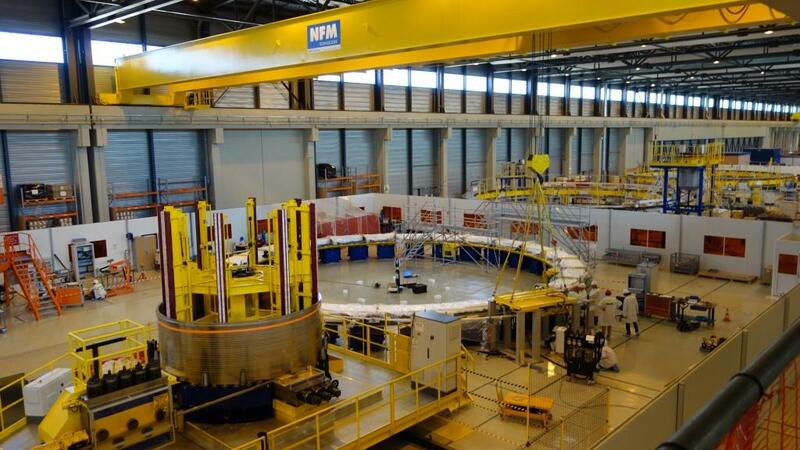 Later, for the two larger coils PF3 and PF4 (24 metres in diameter), it will be expanded. 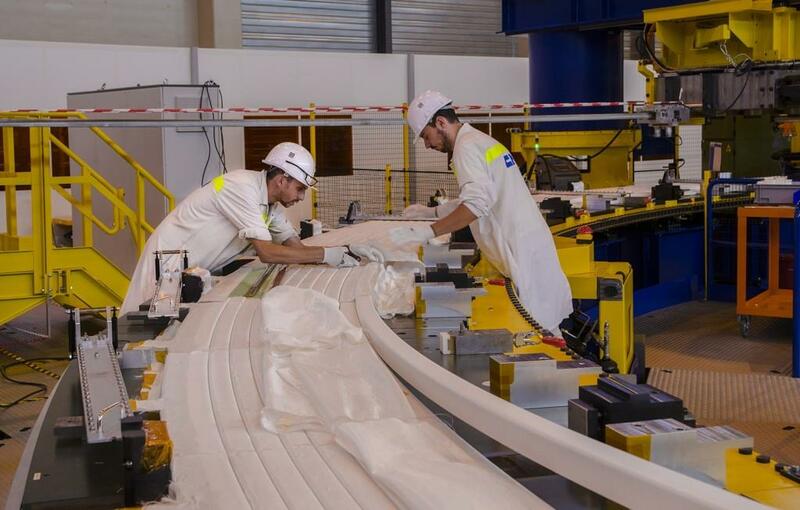 During the winding process the conductor is wrapped with several layers of glass-fibre tape, which insulates the conductor turns one from another. Six of the eight double pancakes needed for PF5 have been wound. 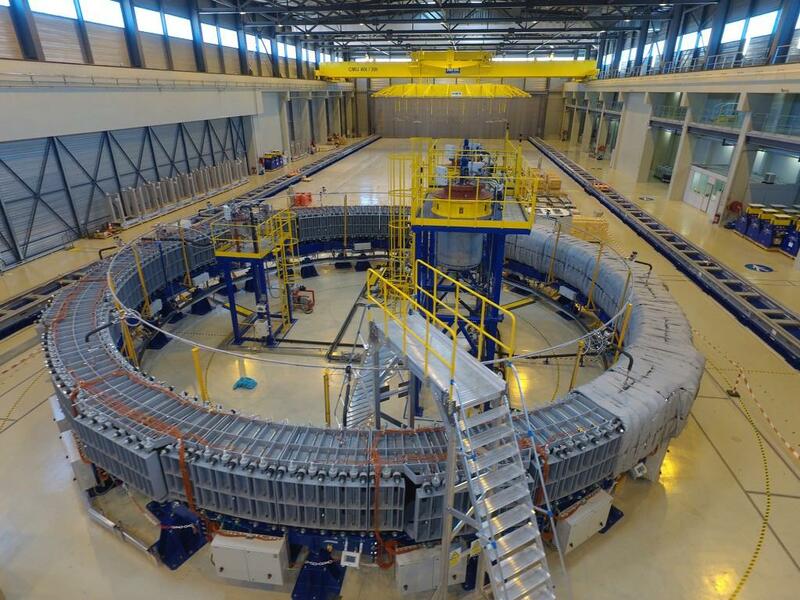 This staging table is used to prepare the double pancakes for the next stage—impregnation. 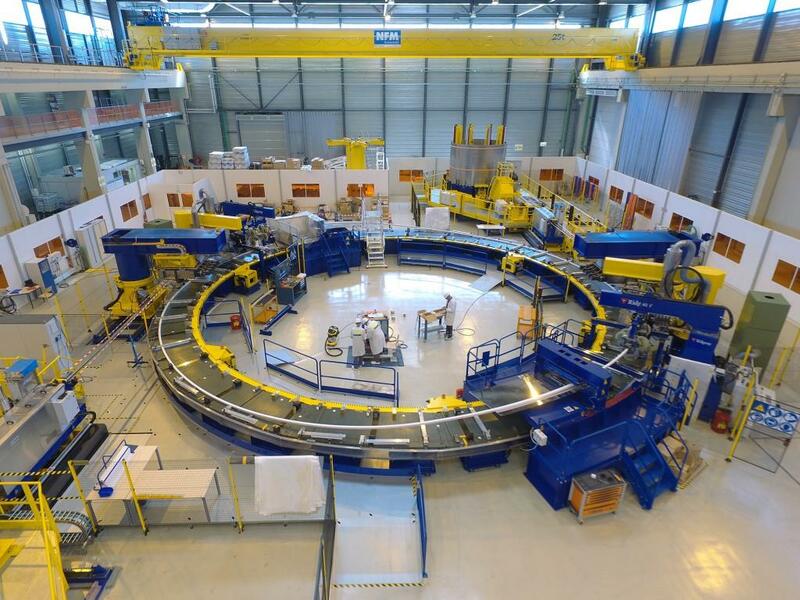 For the second phase of operations, the double pancake windings are transferred by overhead bridge crane to the impregnation area in the centre of the winding facility. The cranes lower the double pancakes into moulds for vacuum pressure impregnation (VPI) with epoxy resin. The resin—acting inside of a sealed mould and under the effect of heat—hardens the glass tape to bond each double pancake into a rigid assembly. The mould is custom built around the double pancake to be impregnated. Current passed through the conductor heats the double pancake to approximately 80 degrees Celsius, all air is removed, and resin is injected slowly to fill all nooks and crannies. A team of 70 people is working daily to meet a tight production schedule. Here, the technicians are monitoring the impregnation of one double pancake. The rigid double pancakes will be stacked and joined electrically to form the winding pack (in the case of PF5, eight double pancakes will be stacked). 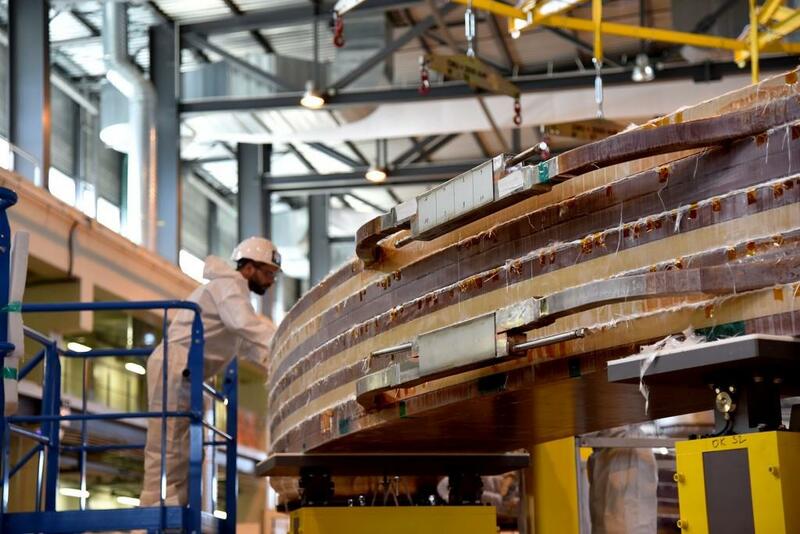 The final assembly will undergo a second impregnation process in this larger mould. 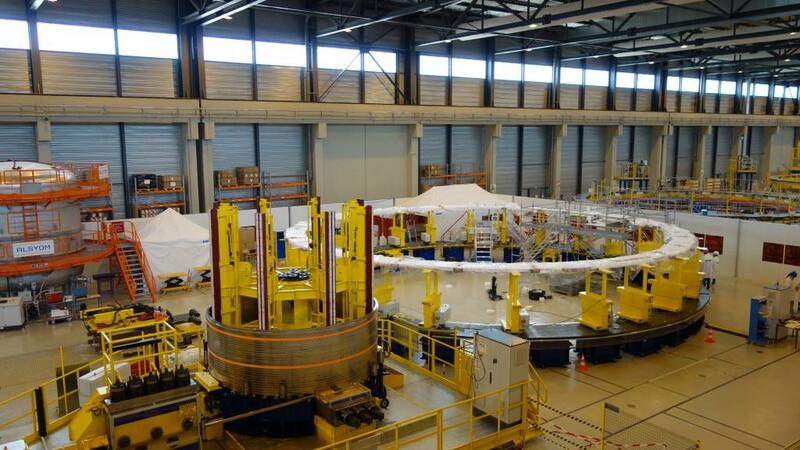 Notice in the foreground, a segment of mockup winding that was created from multiple layers of dummy impregnated conductor lengths to test all processes. 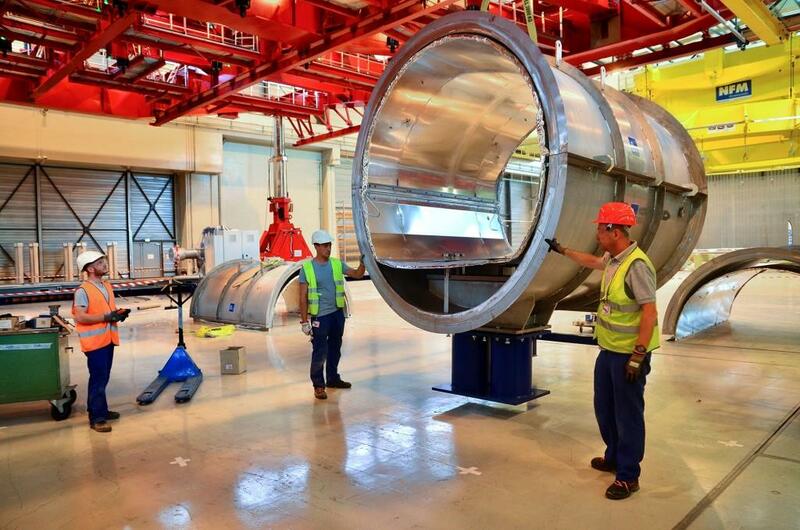 This cryogenic chamber will permit a final coil assembly to be tested at low temperature (approximately 80 K) in order to simulate the thermal stresses and the work conditions that will be experienced during operation. 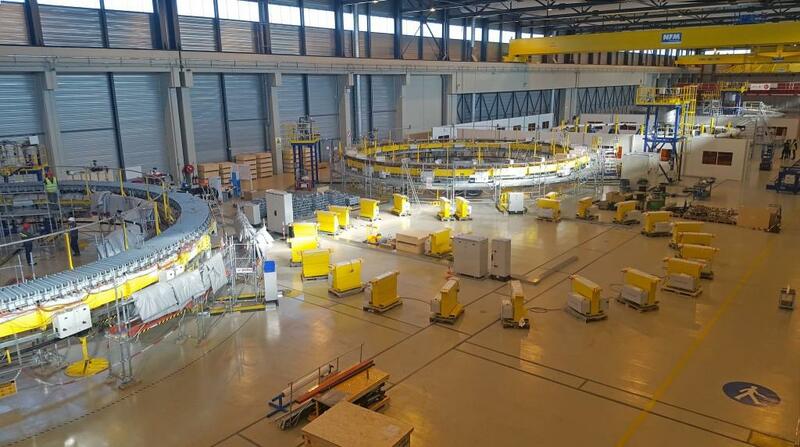 In this way, the performance of the coils will be tested before their installation in the ITER machine. Technicians are active at all of the workstations of the Poloidal Field Coils Winding Facility, either performing work on the first production unit PF5, or qualifying later stages. 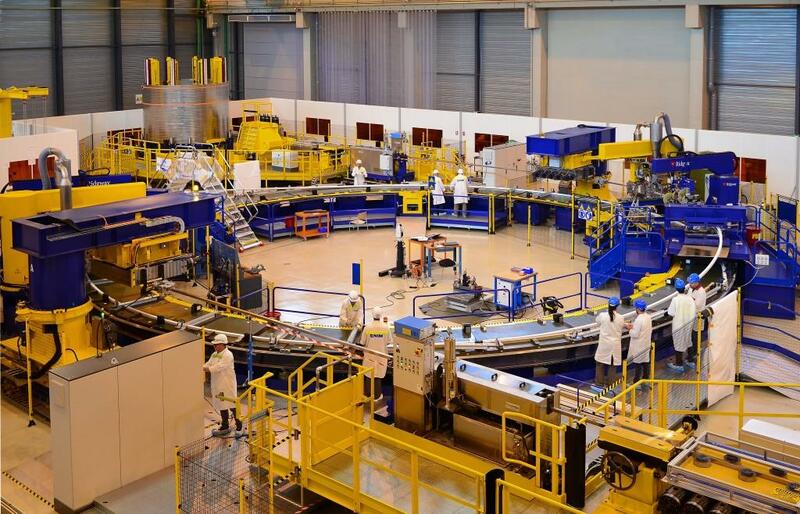 The European Domestic Agency reports that, all activities combined, the first coil is 42 percent complete. 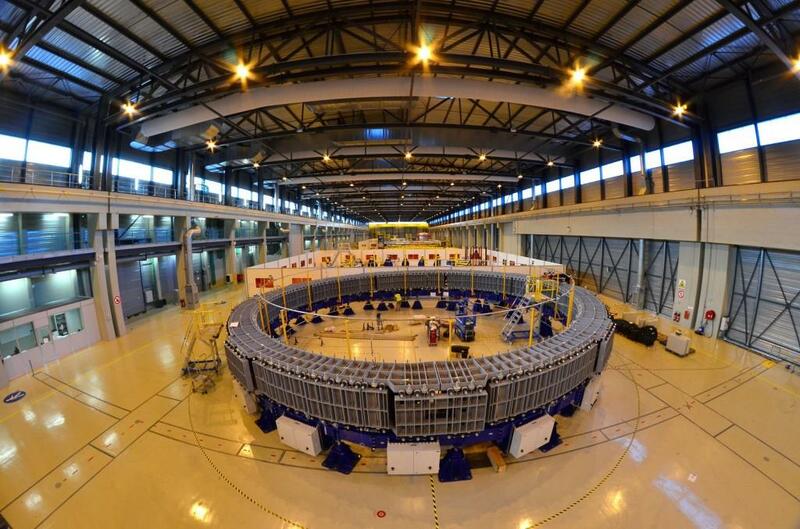 The cold test chamber has been delivered in segments. 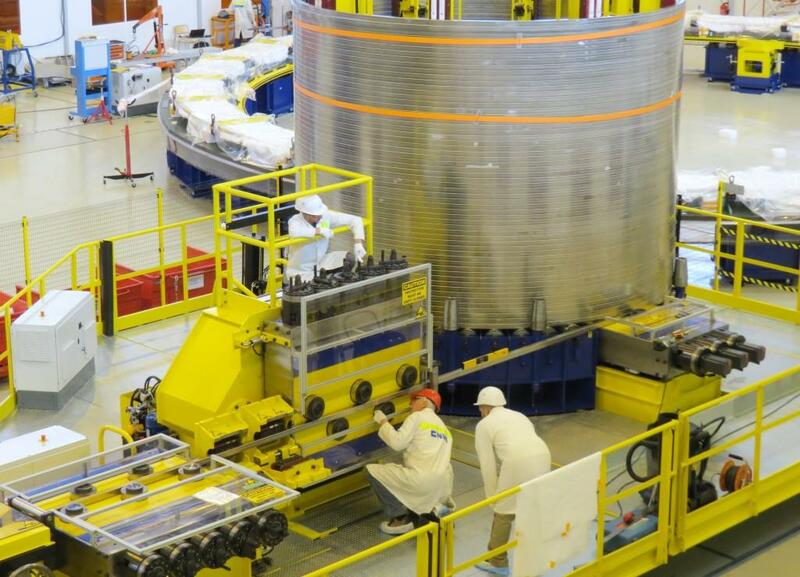 Here we see how the magnet coils will be enclosed in a tube-like structure. One double pancake for PF5 is undergoing impregnation in the background, while assembly is underway on the impregnation mould for another. This "termination box" is welded to the jacket of conductor on one end with a stainless steel pipe for liquid helium cooling exiting on the other end. 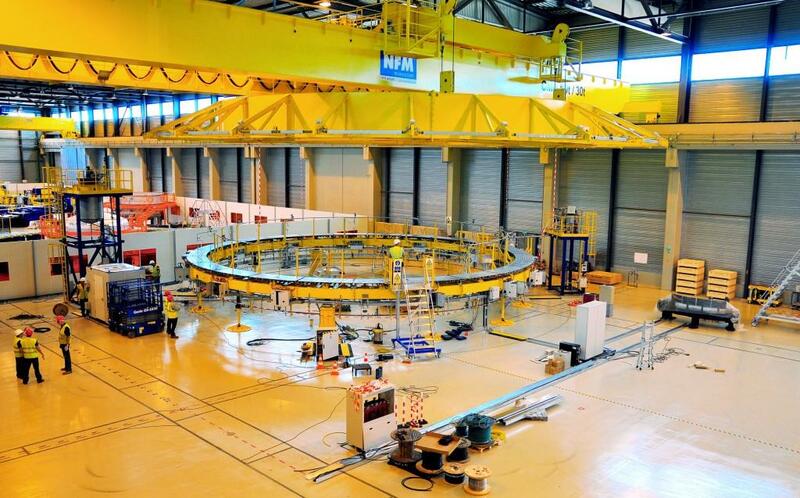 European contractors are winding the sixth in the series of eight double pancakes required by PF5. The winding table rotates slowly as conductor is fed simultaneously from two spools in a process known as "two-in-hand" winding. 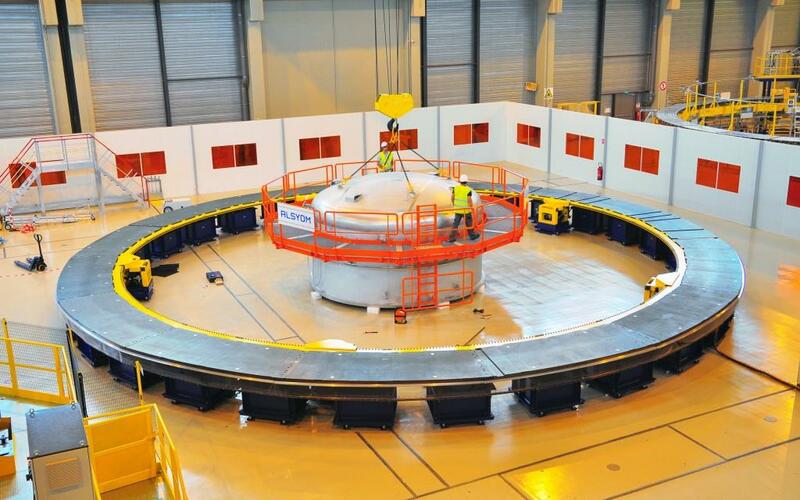 European contractors are installing a cold test chamber for the last phase of production: cooling the completed coil to approximately 80 K (-193 °C) in order to simulate the thermal stresses and the work conditions that will be experienced during operation. After completing the winding, the next step is to shape the "terminations"—the areas that connect one conductor length electrically to another, or one double pancake to another. A portion of conductor is opened, the turn insulation is removed and moulds are brought close to the double pancake to shape its end into a "termination joggle." 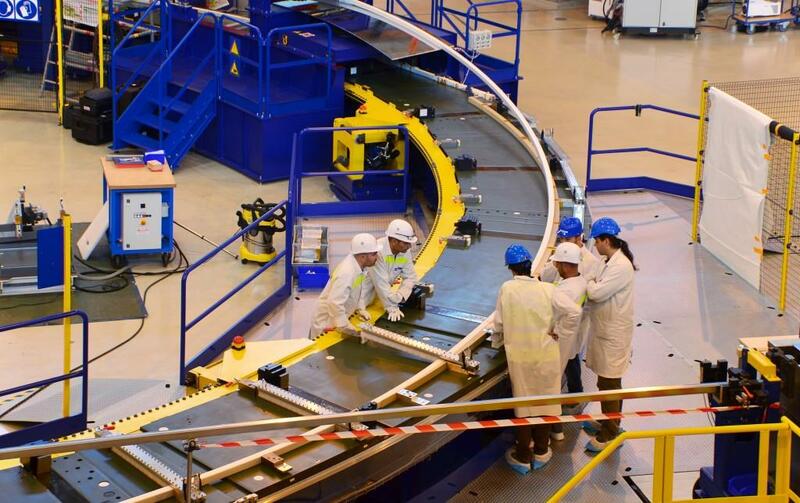 Attached to the circular spreader beam, one of three finalized double pancakes (out of eight needed to complete the winding pack for PF5) is prepared for impregnation operations. 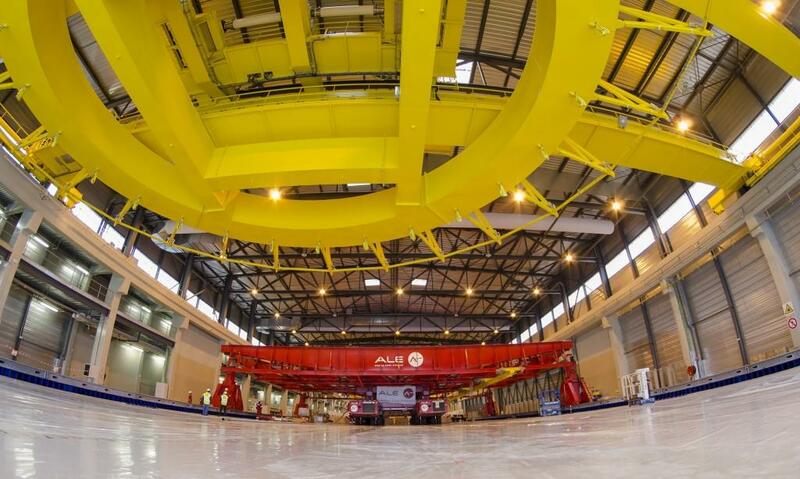 The new gantry crane in the Poloidal Field Coils Winding Facility has a nominal lifting capacity of 400 tonnes. It was tested in February at 125% of nominal (static) and 110% of nominal (dynamic), with successful results. 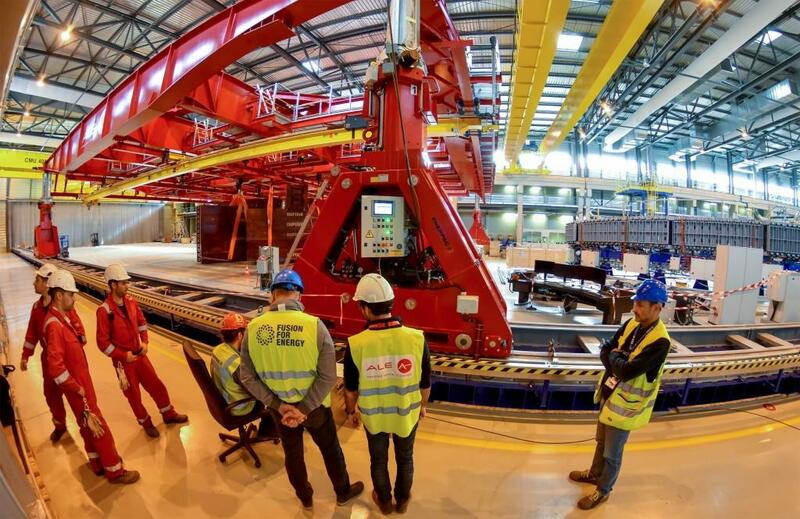 The gantry crane is made up of a 30-metre-in-diameter steel structure supported by four hydraulic towers traveling on rails, capable of lifting the heaviest components of the ring-shaped coils throughout the last stages of fabrication. 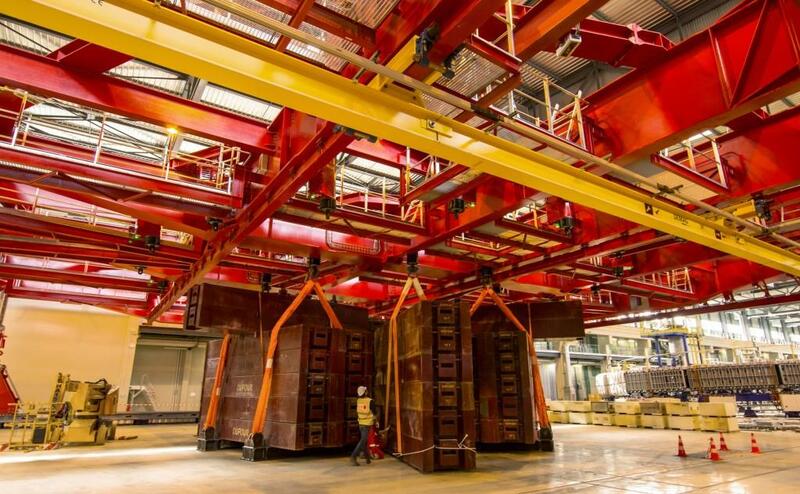 In December, the new gantry crane was delivered to its installation location on the north end of the building, where it will be installed on its four "legs." Four hydraulic towers and circular beam in a square frame form the 30-metre-in-diameter gantry crane, capable of lifting 400 tonnes. 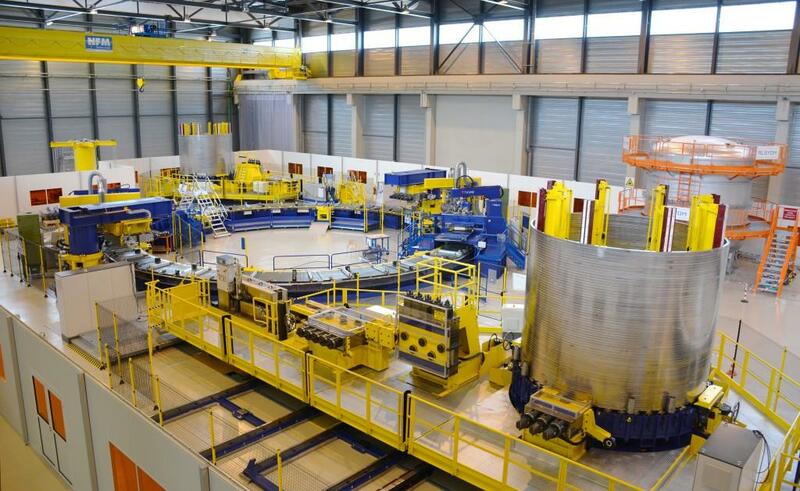 While double pancake winding is underway in the foreground, European contractors are preparing the second station—impregnation—for qualification tests. Work is underway on the second production double pancake. 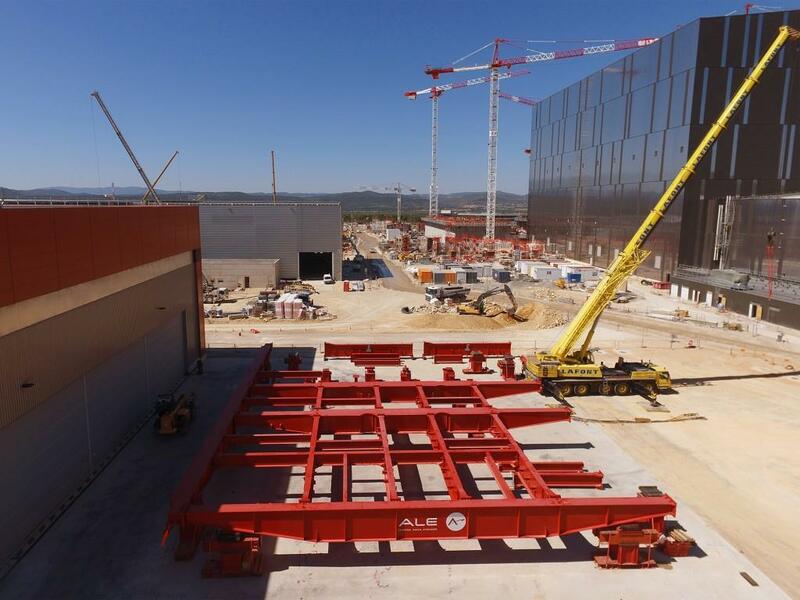 The main structure of the new gantry crane has been assembled outside of the building and is now positioned outside of the north door. 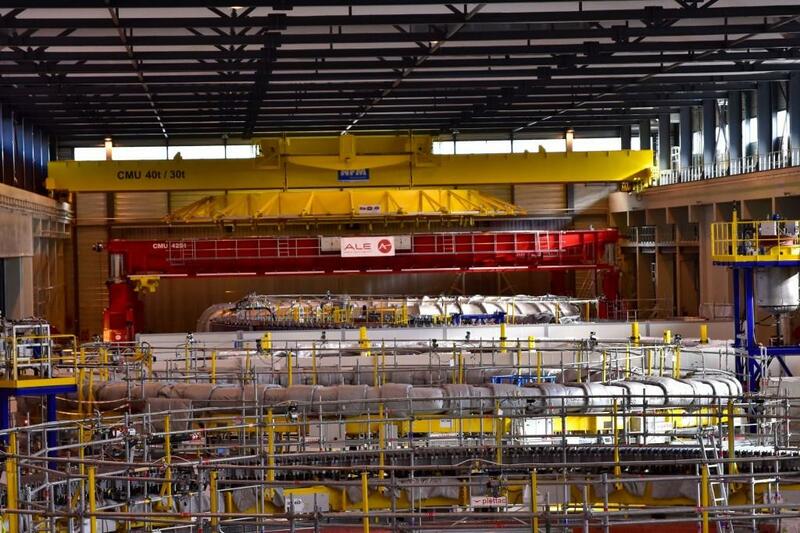 The first production double pancake has been placed in a staging area so that additional activities can be carried out (the addition of terminations, the brasing of the intra-pancake joint, and additional insulation). Immaculate fabric, precise measurements and a large pair of scissors: the winding table in the Poloidal Field Coils Winding Facility could be mistaken these days for a high-tech tailor's workshop. 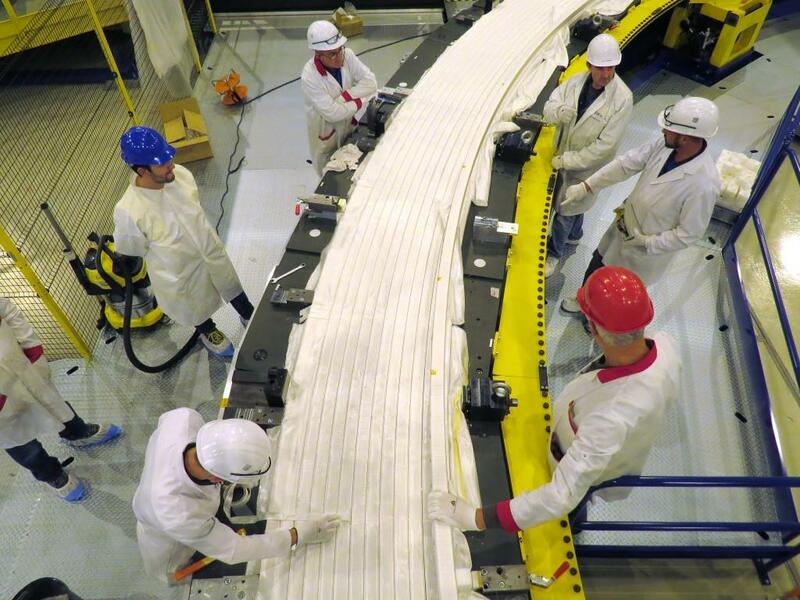 Here, technicians are manually inserting fiberglass material between the turns of conductor. 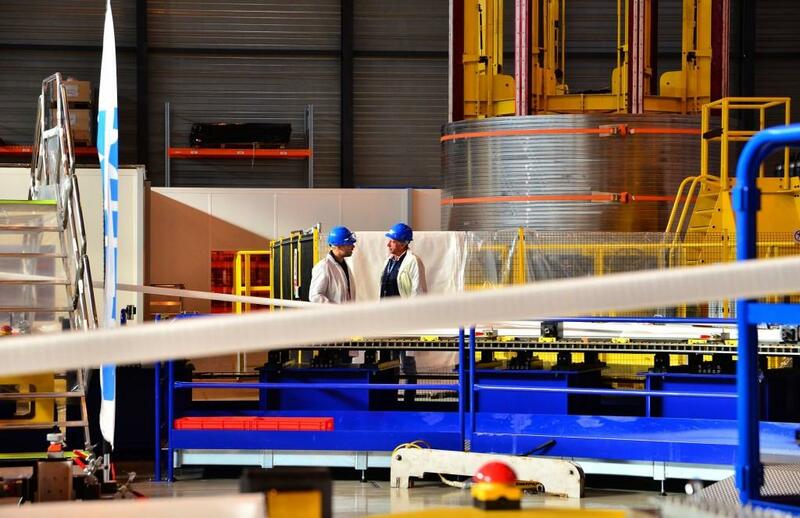 The tape dispenser is in motion, automatically wrapping the conductor with five layers of insulating material. 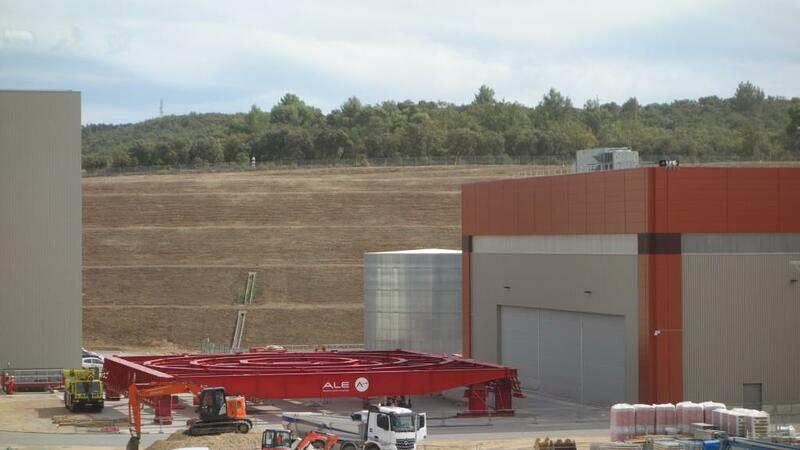 A large gantry crane is being assembled outside the north entrance to the Poloidal Field Winding Facility, which will soon be moved inside. Here's how the double pancakes are transported from one station to another: the 40-tonne circular spreader beam. 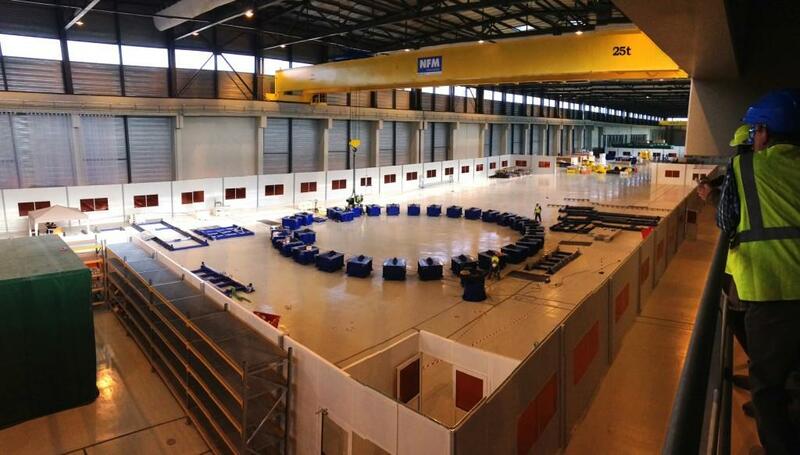 The "pieces" of the gantry crane are starting to arrive. 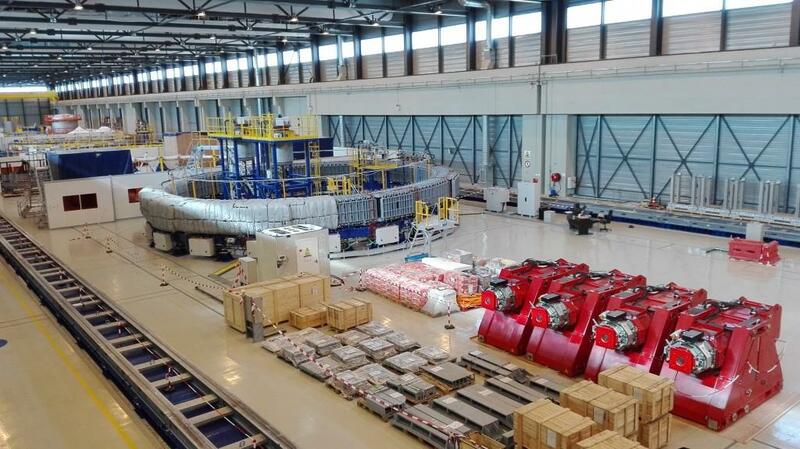 The circular station in the background is where the entire coil assembly (eight stacked double pancakes in the case of PF5) will undergo impregnation—a process that "hardens" the assembly and insulates it electrically. Large tracks have been laid for the gantry crane. 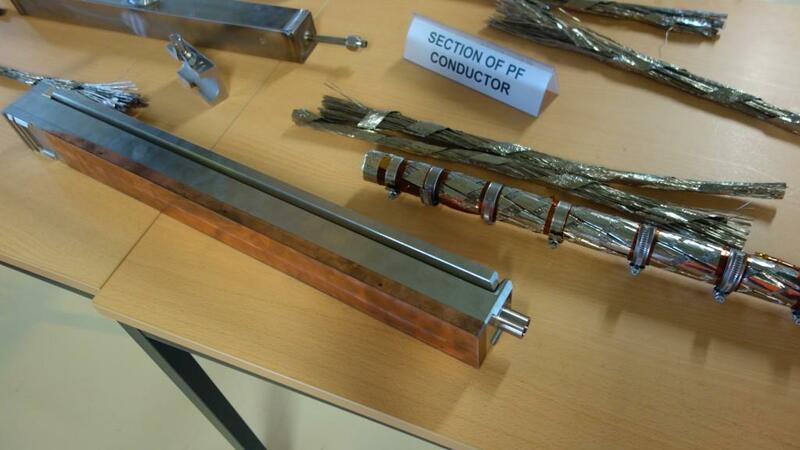 On display for visitors in the European winding facility are some of the critical elements of the fabrication process: superconducting strand, cable, conductor, and helium inlet joints. 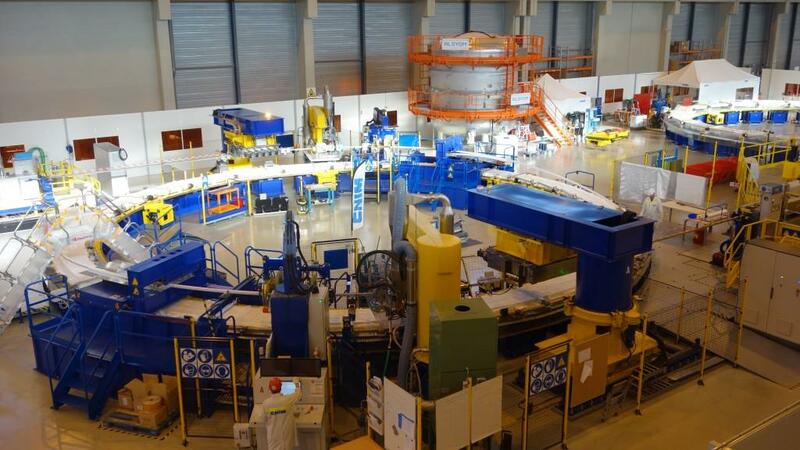 While the first double pancake for poloidal field coil #5 is in the last stages of winding (out of frame, far left), the copper dummy winding on the staging table (centre) is being prepped for impregnation. 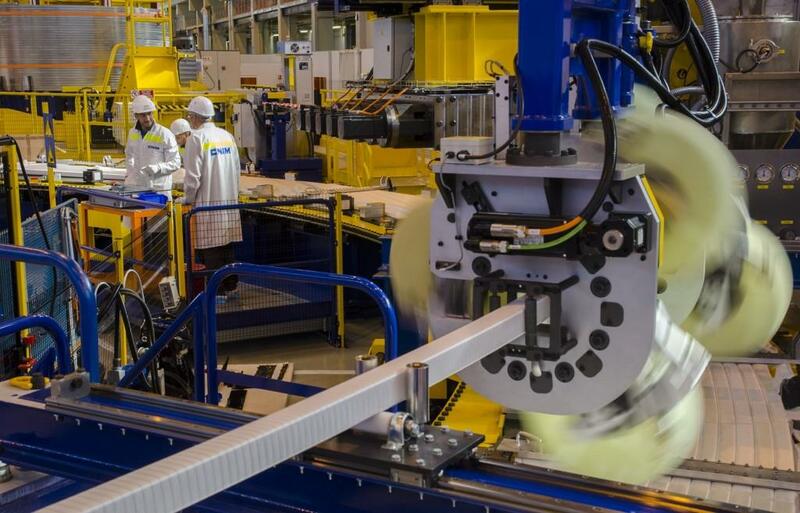 In a vast manufacturing facility on the ITER site, the poloidal field coil team is starting on the second layer of production double pancake number one. 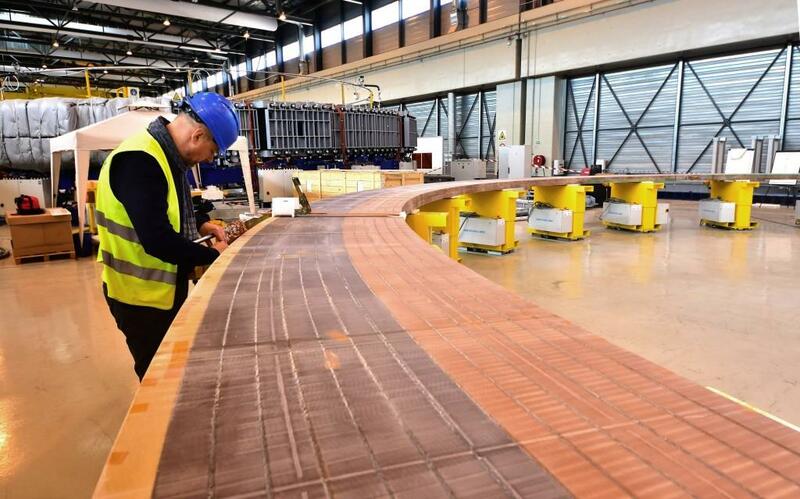 The qualification winding, made of copper conductor, rests on a staging table while preparations are made for impregnation. Operators can wind approximately 20 metres of conductor before it's time to renew the taping heads and replenish the sandblasting cleaning equipment with fresh sand. Creating the first double-layer winding pack for poloidal field coil #5 is a highly sophisticated technological operation. But when it comes to measurements, nothing beats the good old calliper. The steel-jacketed conductor is wrapped with several layers of tight-fitting insulating tape, and then enveloped in a special fabric. 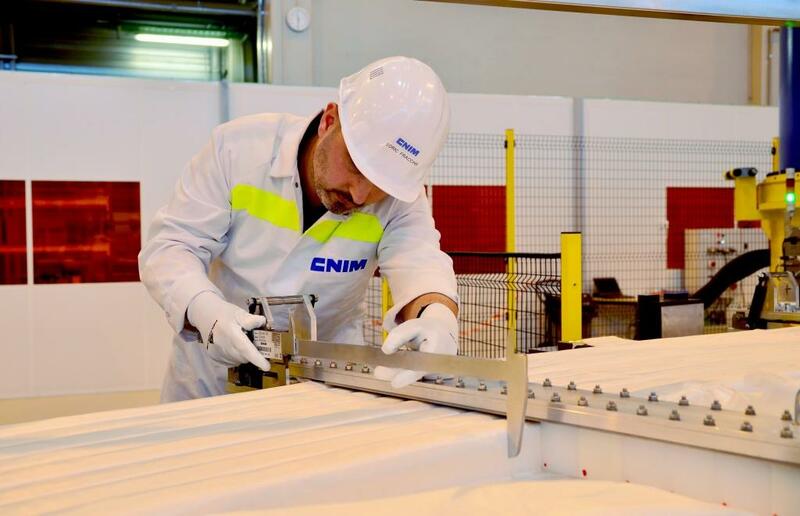 This technician from the European firm CNIM (contractor to the European Domestic Agency) carefully checks the conformity of the tight gaps between conductor turns. 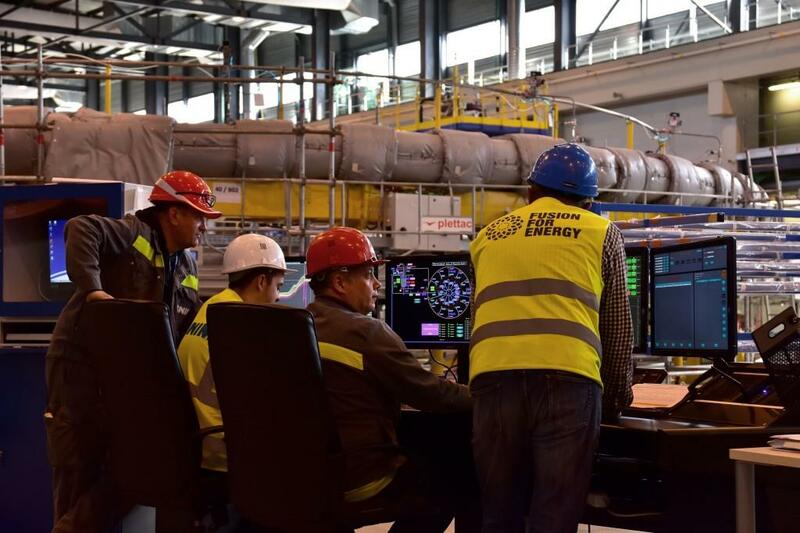 Winding activities are closely monitored by the European Domestic Agency and specialists from the engineering integrator ASG Superconductors. Note the tape dispenser spinning in the background. 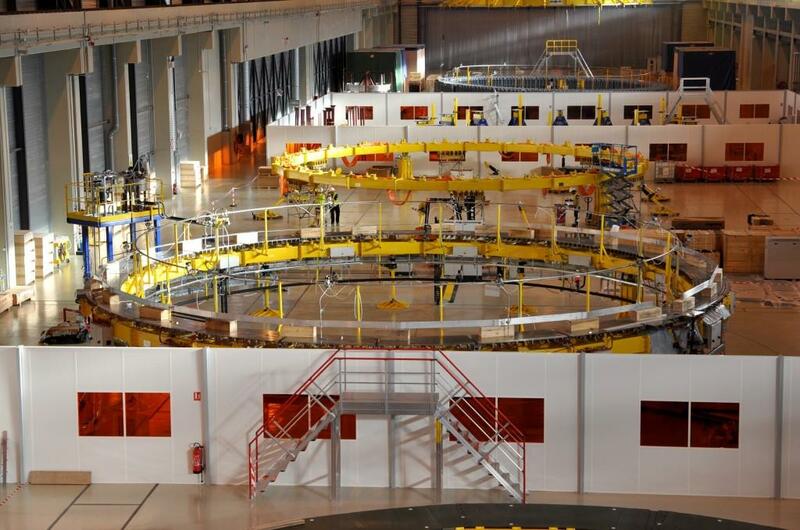 After the validation of qualification activities, Europe begins the winding of coil #5 in April in the on-site Poloidal Field Coils Winding Facility. 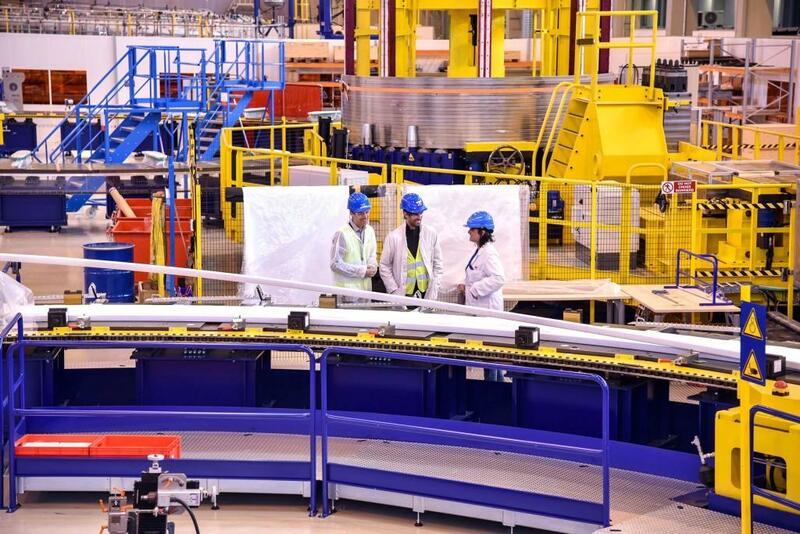 Lab coats and overshoes are mandatory in the "clean room" where operators have started on the first conductor turn for poloidal field coil #5 (PF5). 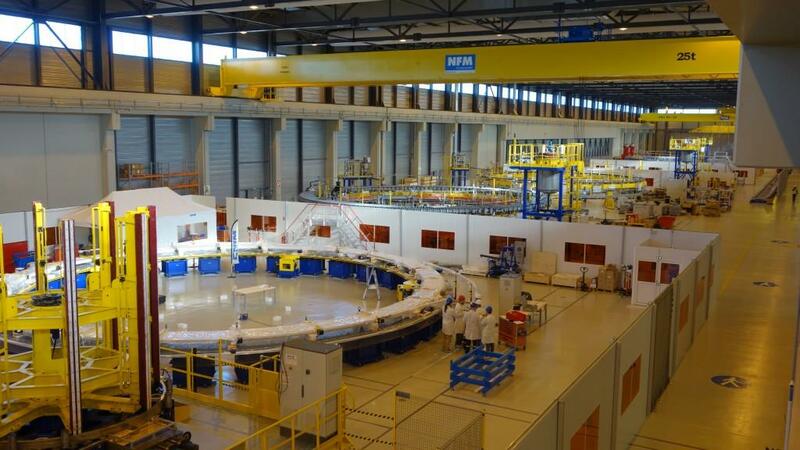 Technicians from the European contractor CNIM supervise the first stage of operations: the uncoiling and straightening of the spooled niobium-titanium conductor. 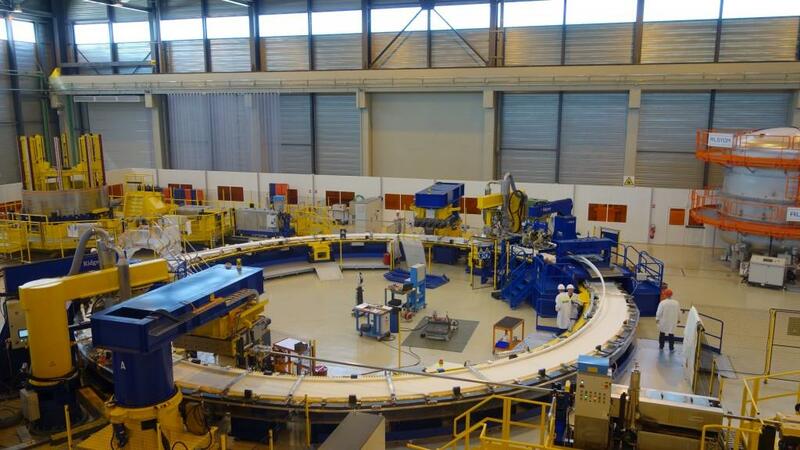 The first conductor length enters the straightening equipment at the start of the winding table. Conductor is fed in from two points at once in a process known as "double-hand winding." 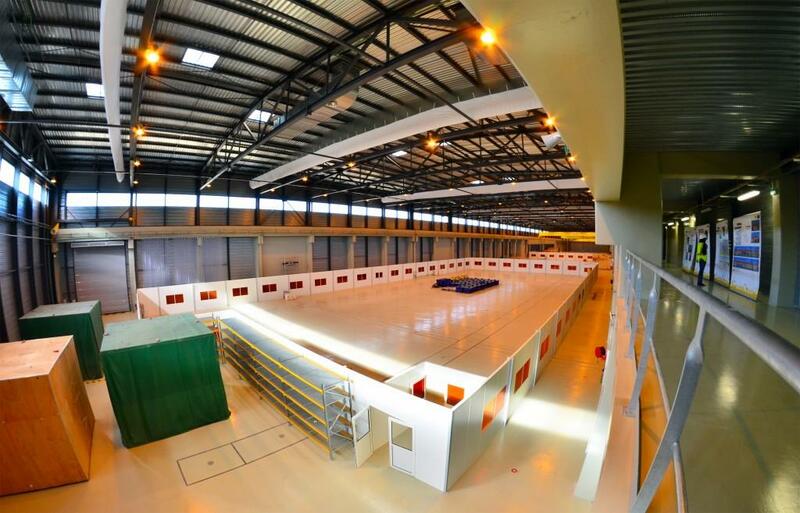 The Poloidal Field Winding Facility as photographed in January 2017. Tooling stations are now framed out from one end of the building to the other. 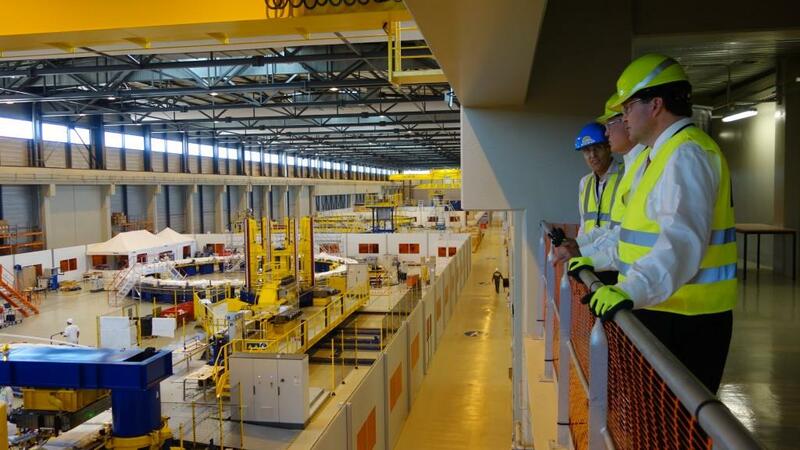 The 20-tonne conductor spools delivered by China are installed by overhead crane (with the assistance of the star-shaped tool at right) on the tower situated at left. From there, the conductor is straightened, cleaned and then bent again on the winding table to match the geometry of the future coil. 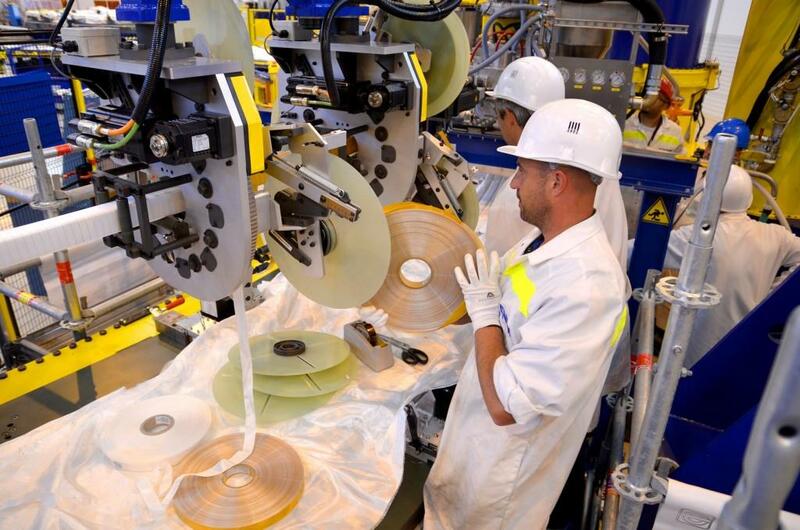 As the conductor enters the winding table, a device comparable to a complex, high-tech scotch tape dispenser tightly wraps it in layers of insulating fiberglass tape. 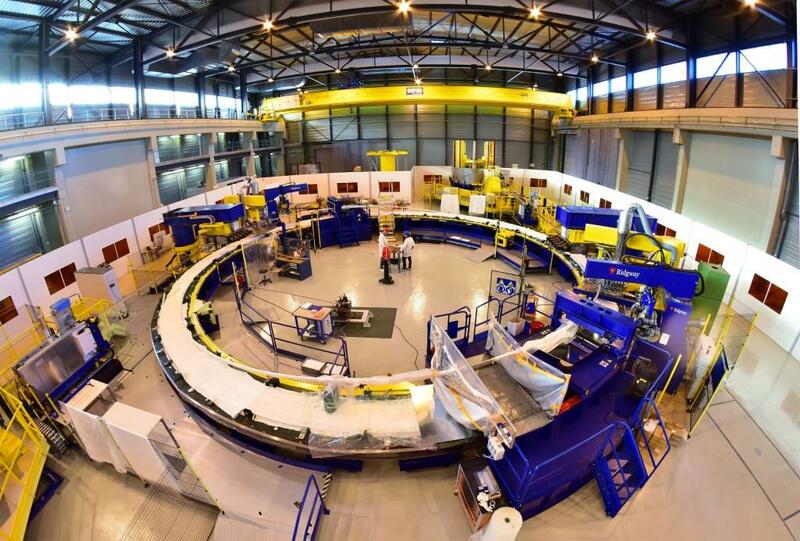 The carefully synchronized winding and wrapping operations result in a "double pancake" made of several "turns" of insulated coil. Before they are stacked to form a coil, each double pancake must be impregnated with epoxy resin under vacuum pressure to electrically insulate and bond each double pancake into a rigid assembly. Two impregnation stations are under construction now. 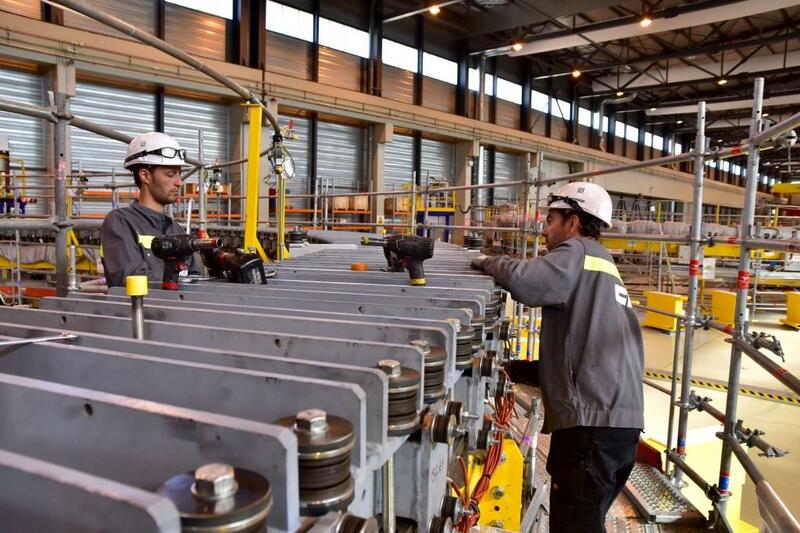 In the last production phase, double pancakes are stacked and connected electrically. 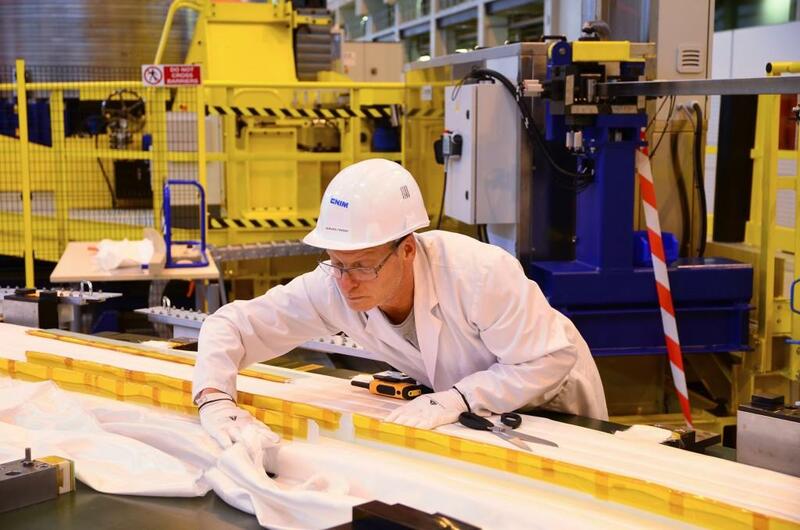 The several-hundred-tonne winding pack is transferred to the final station for resin impregnation of the whole assembly. 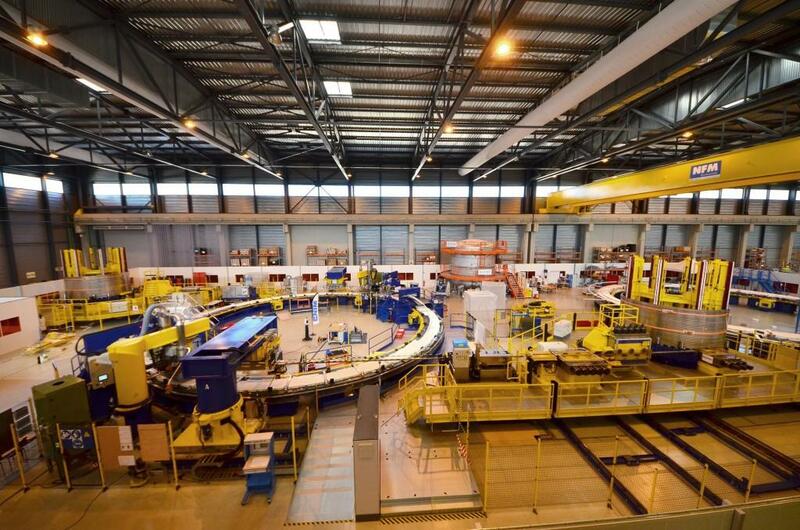 The first complete double pancake layer, made from "dummy" conductor in copper, reflects the dimensions of ITER's fifth poloidal field coil (PF5). 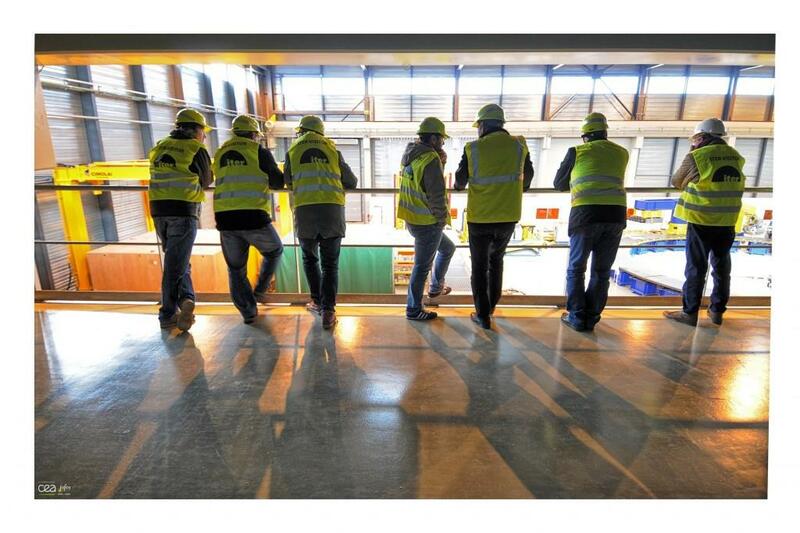 From a visitor gallery in the middle of the 257-metre-long building, we look south toward the impregnation and winding stations. 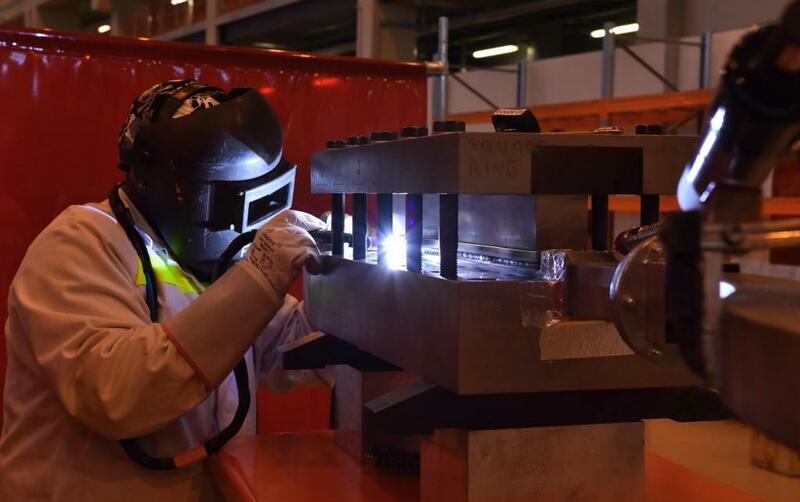 A European contractor practices one important stage of the manufacturing process: creating the inlets in the conductors for helium. An average of eight helium inlets will be needed per coil. 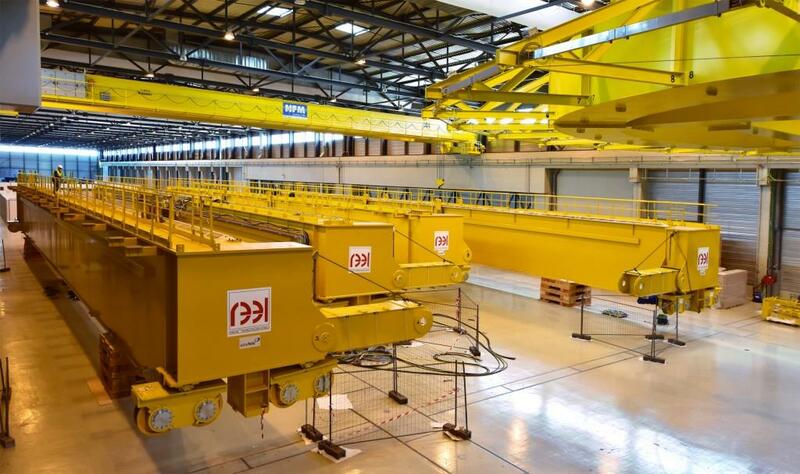 The overhead crane and its spreader beam will be capable of lifting the individual windings and transporting them from one station to the next with a minimum of tilt. 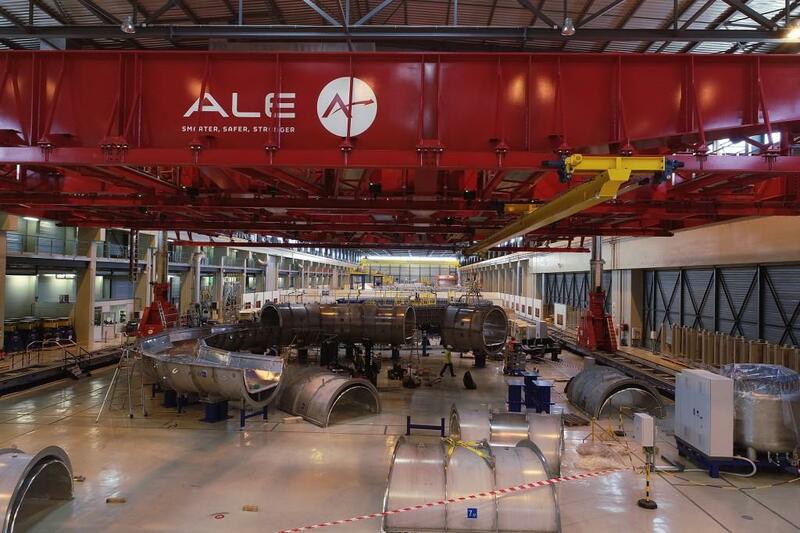 For the handling of the final assemblies, however, a gantry crane will be necessary. 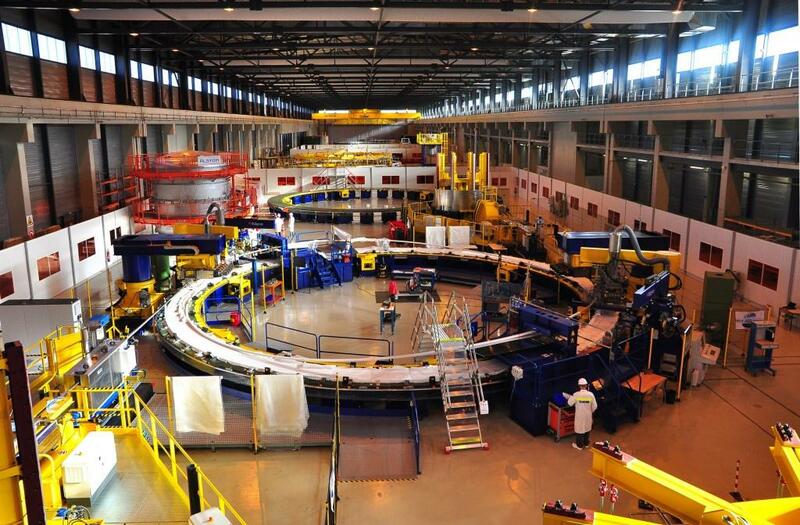 Late August, contractors install the impregnation table in the Poloidal Field Coils Winding Facility. The spools of conductor undergo helium tests before the material is introduced on the winding lines. 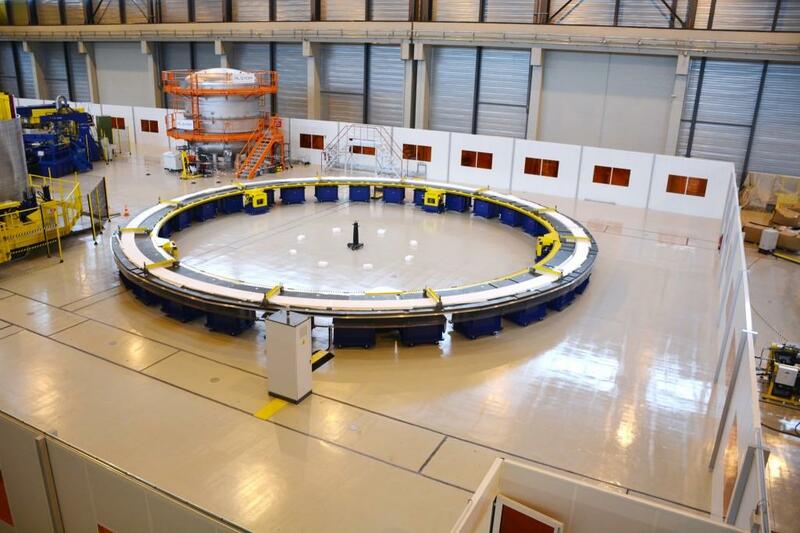 Here, we see the top part of the vacuum chamber that is used for the testing. 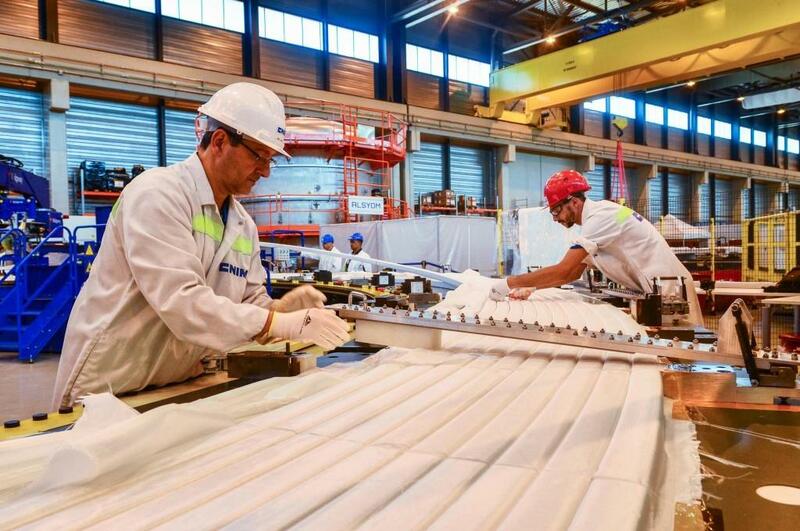 In the winding stage of fabrication, the conductor is uncoiled from the spools and straightened before passing through cleaning and sandblasting machines that prepare its surface to receive several layers of glass-fibre insulating tape. 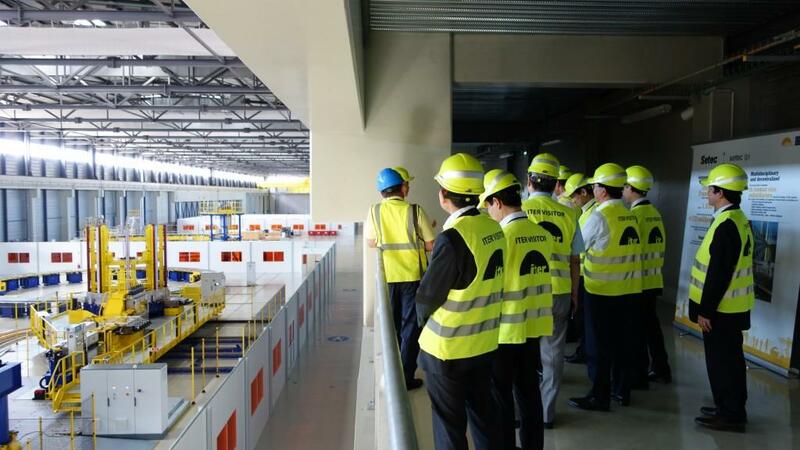 In July, a delegation from Japan looks out over the first on-site manufacturing activities for the ITER poloidal field magnet coils. 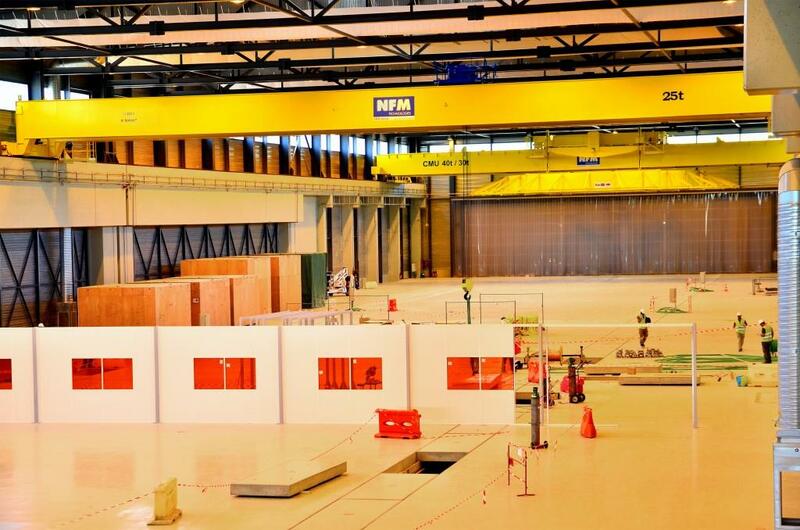 In the second clean zone of the facility, an impregnation table has been installed. 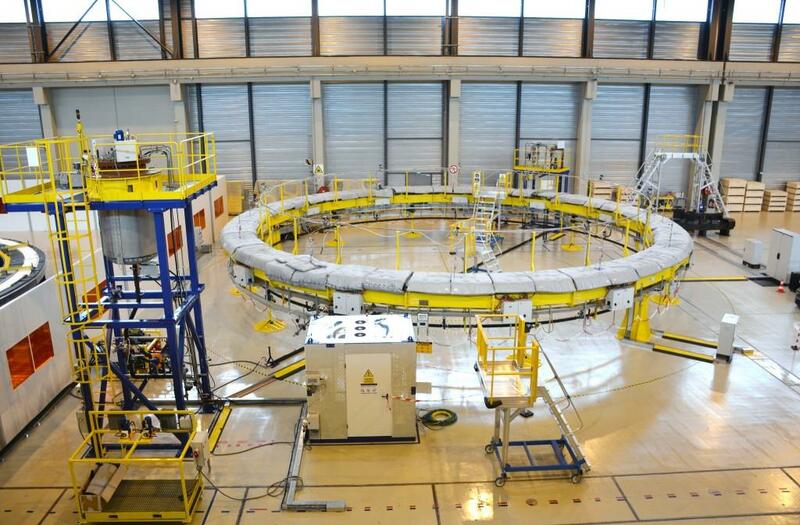 Here, the coiled "double pancakes" produced during the winding stage are impregnated with epoxy resin in order to provide rigidity and electrical insulation. 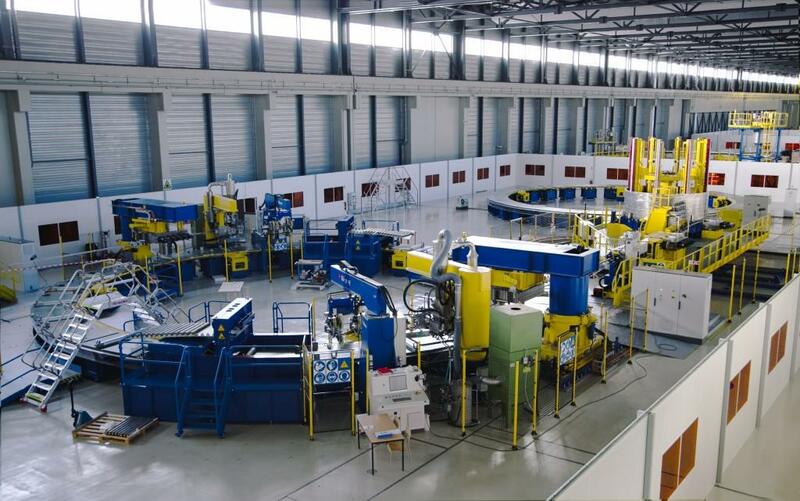 The winding zone (near) and impregnation zone (far) are both visible in this photo of the Poloidal Field Coils Winding Facility. 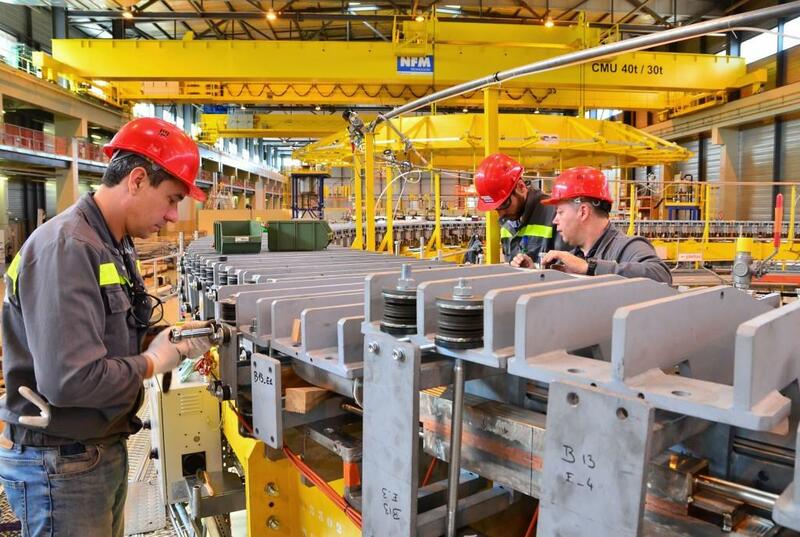 The four overhead crane girders have been stored in the Poloidal Field Coil Winding Facility until they can be assembled with gear motors, braces, electrical equipment and the like. In June, they will be moved to the Assembly Hall for installation. 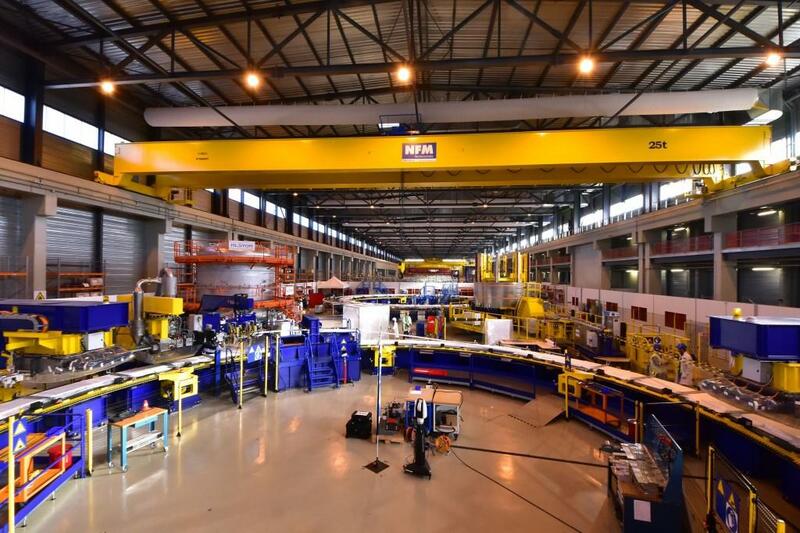 The mammoth assembly crane beams will be stored in the Poloidal Field Coils Winding Facility until their installation in the Assembly Building in June. 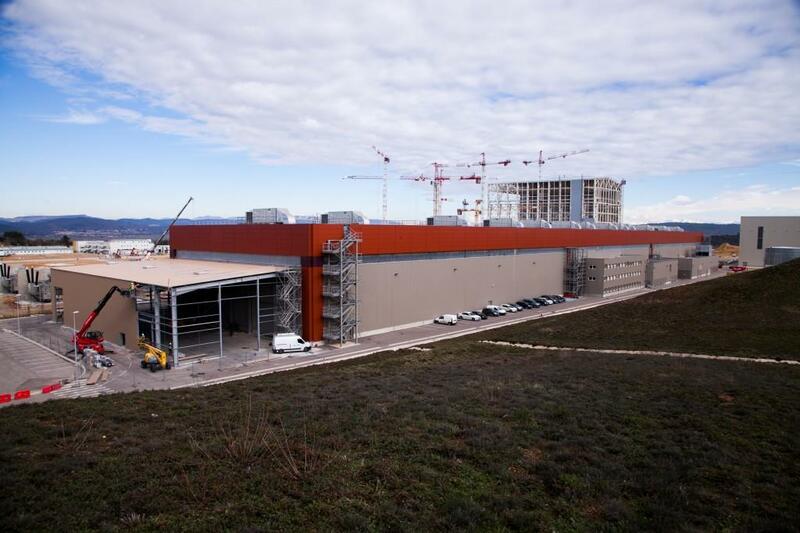 A small extension is going up on the south side of the Poloidal Field Coils Winding Facility. It will be used for storage. 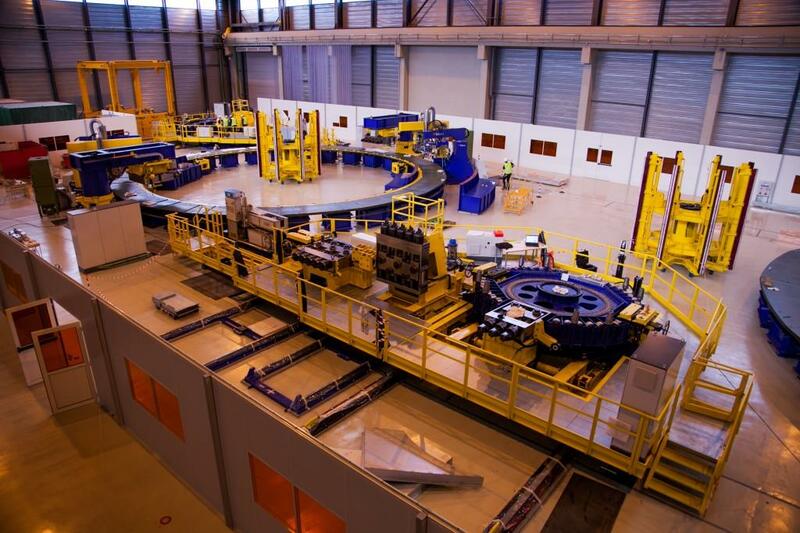 Tooling progresses in the on-site winding facility for poloidal field coils. 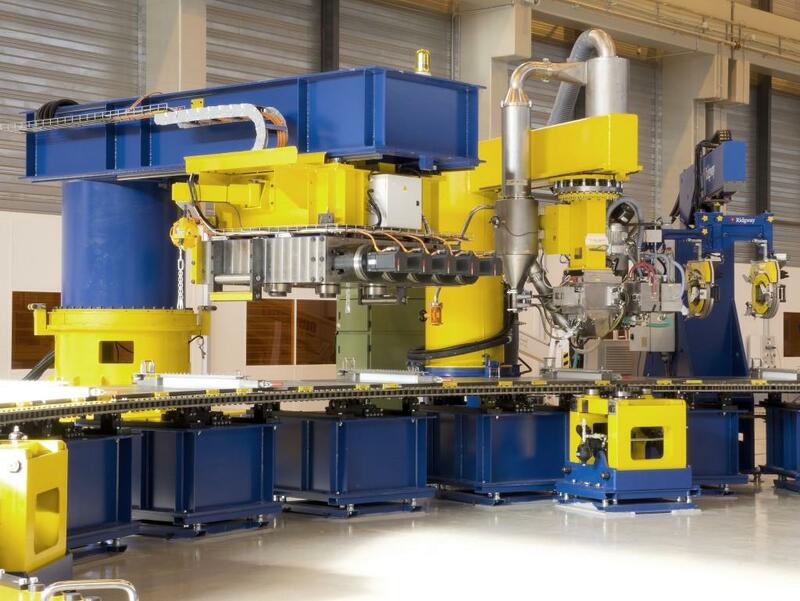 Work will begin this summer on the first "pre-dummy" winding that kick off the qualification phase for tools and procedures. 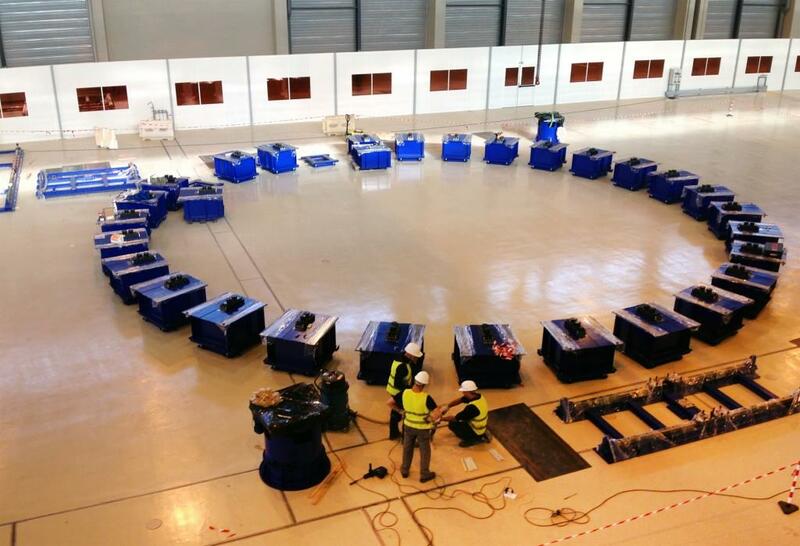 Four poloidal field coils will be manufactured in the on-site winding facility (coils 2, 3, 4, and 5). Operations will begin at the double winding station on the south side of the building. 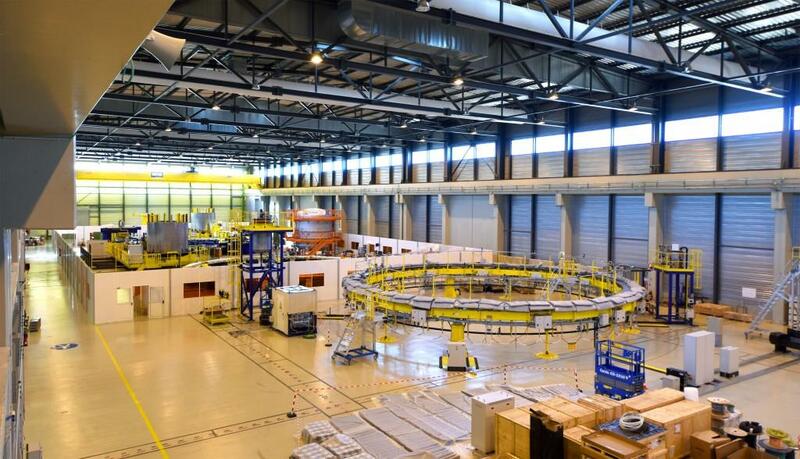 Here, spools of niobium-titanium (NbTi) superconductor will be wound into flat, spiralled coils called "double pancakes." 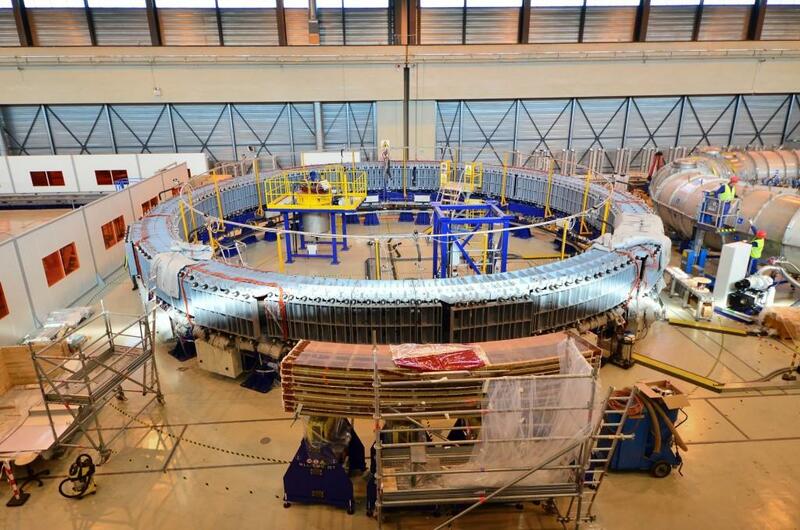 Up to eight double pancakes will be assembled into each magnet coil. 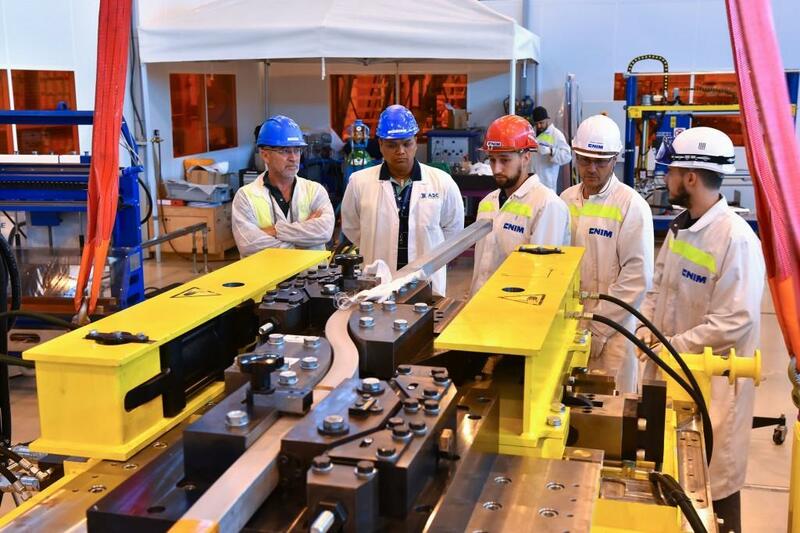 Workers from the European contractor SEA ALP (Turin, Italy) are currently installing the first poloidal field coil winding tooling table in the on-site Poloidal Field Coils Winding Facility. 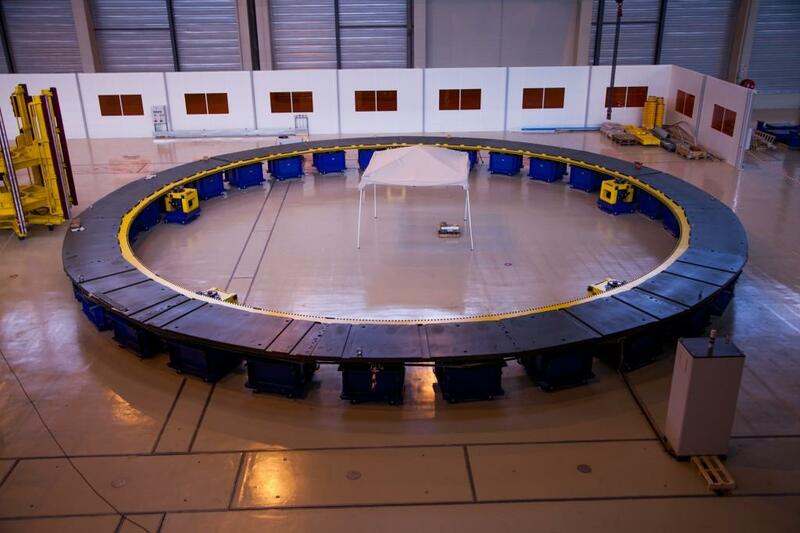 Two winding tables will operate side by side to produce flat, spiralled coils called "double pancakes." 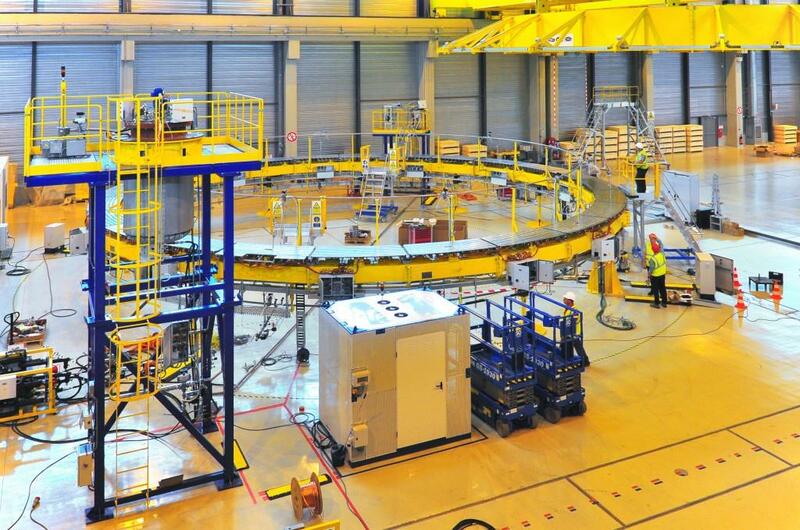 In this building, up to eight double pancakes will be stacked to form the final coils. 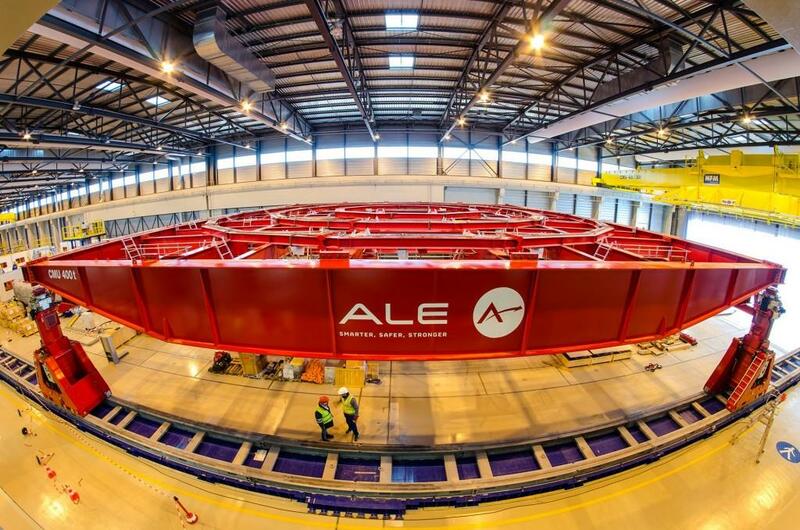 Overhead cranes will travel the length of the 257-metre Poloidal Field Coils facility to transport the double pancake windings from station to station. 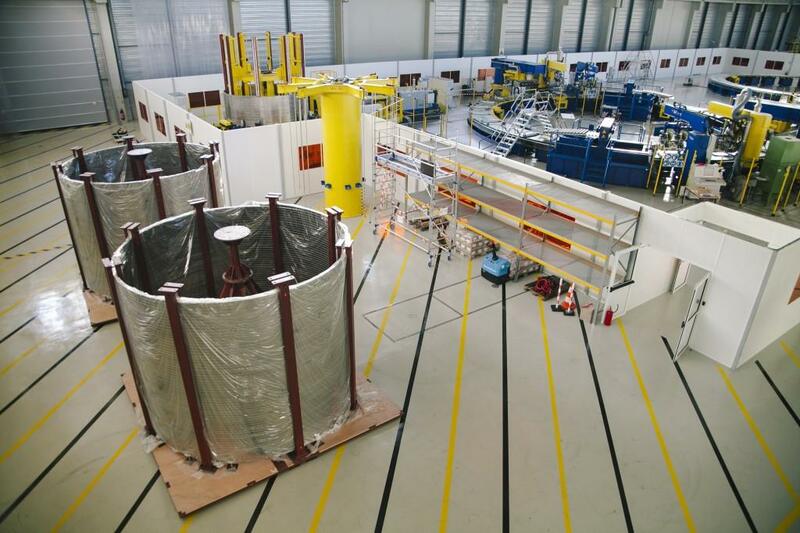 The complete process, from winding to finished coil, will take approximately two years. 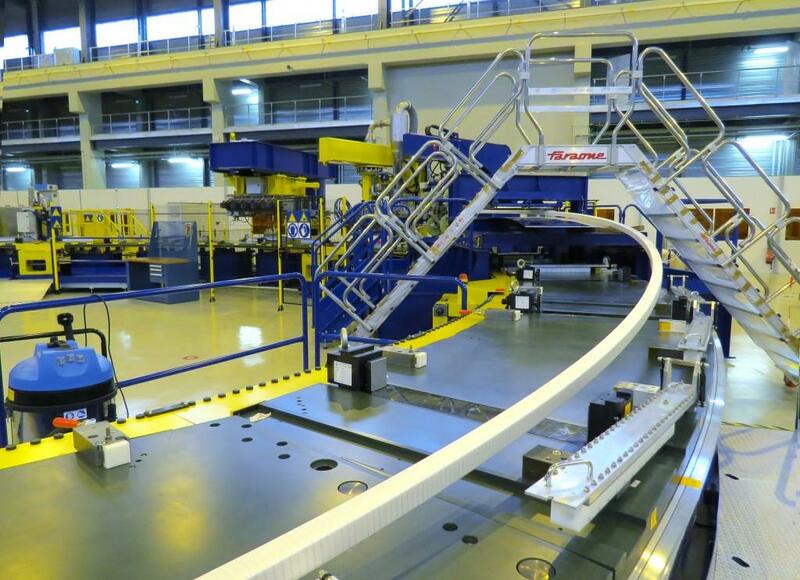 The clean area on the south side of the building will host two winding tables, where lengths of niobium-titanium conductor will be fed from two spools simultaneously ("two-in-hand" winding), insulated, and wound into double pancakes. Dummy conductor for tooling qualification is stored in the crates, at left. 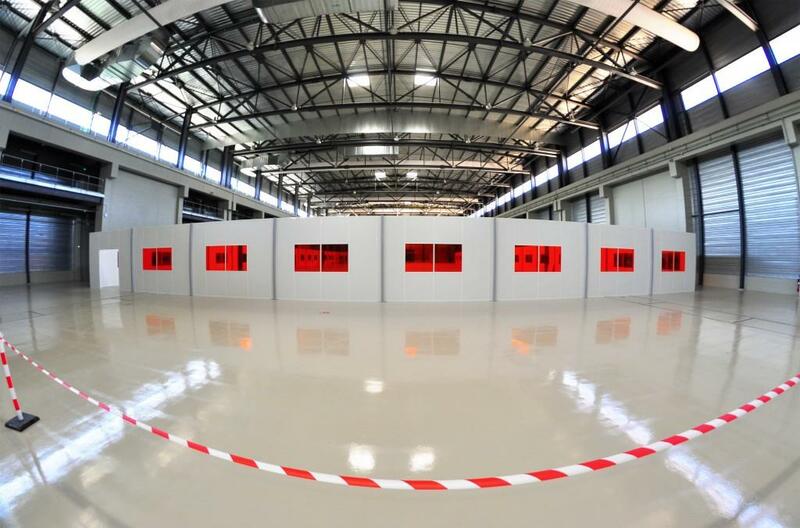 In July, a clean area is established around the area of the Poloidal Field Coils Winding Facility that will host the winding tooling. 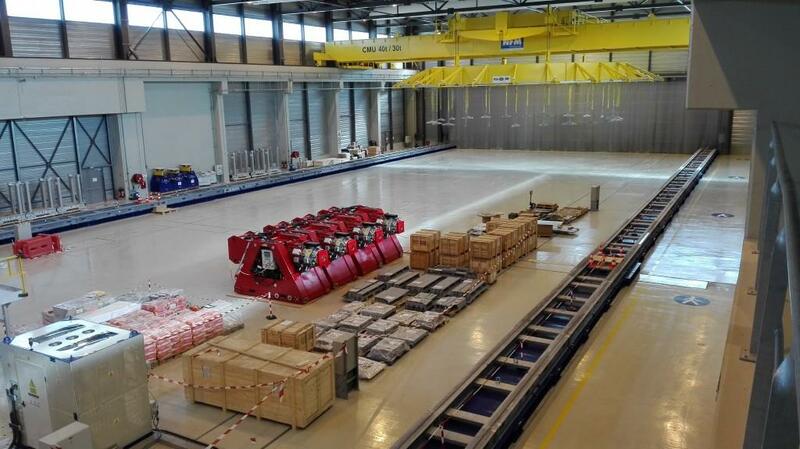 The first tooling elements also arrived by truck this month. 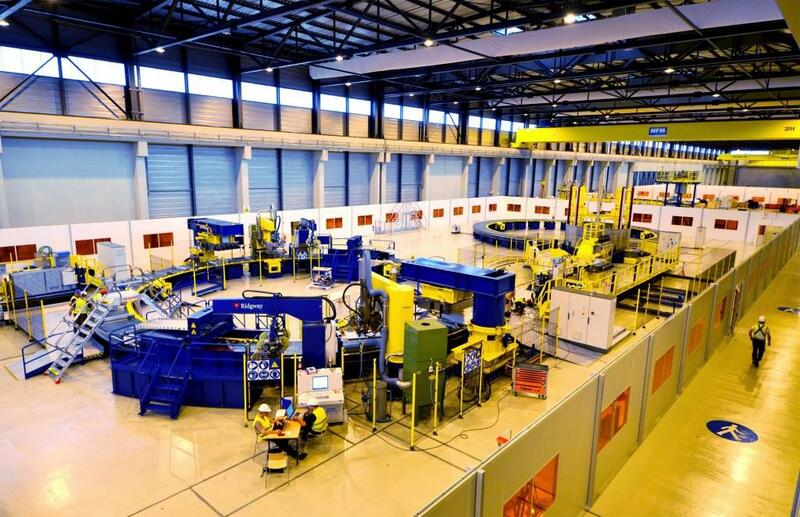 One of only two manufacturing facilities located on the ITER site, the Poloidal Field Coils Winding Facility was constructed by Europe to house the winding and assembly activities for four of ITER's giant ring-shaped magnets. 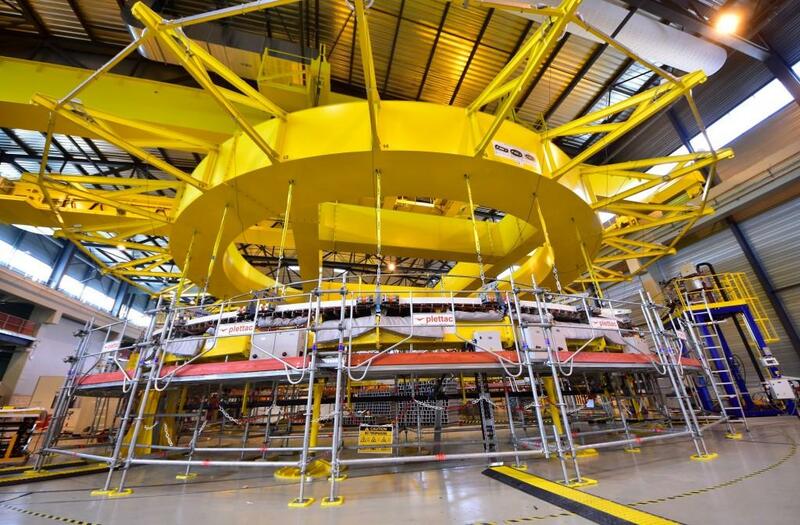 Ranging in diameter from 17 to 24 metres and weighing 200 to 400 tonnes, coils PF2, PF3, PF4, and PF5 are simply too big to be manufactured off site and shipped to ITER. 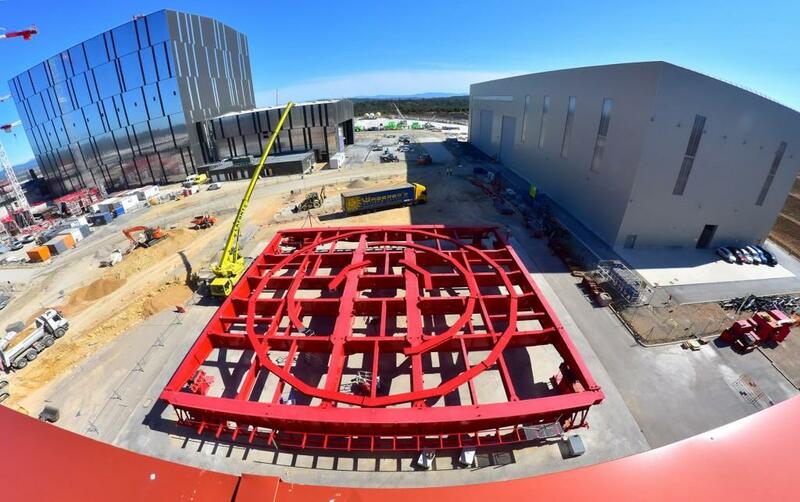 European contractors have equipped the building with the high-tech machinery that is required to carry out the successive stages of the fabrication process, from winding the building blocks of each coil, to stacking and creating the final assembly, to cold testing. 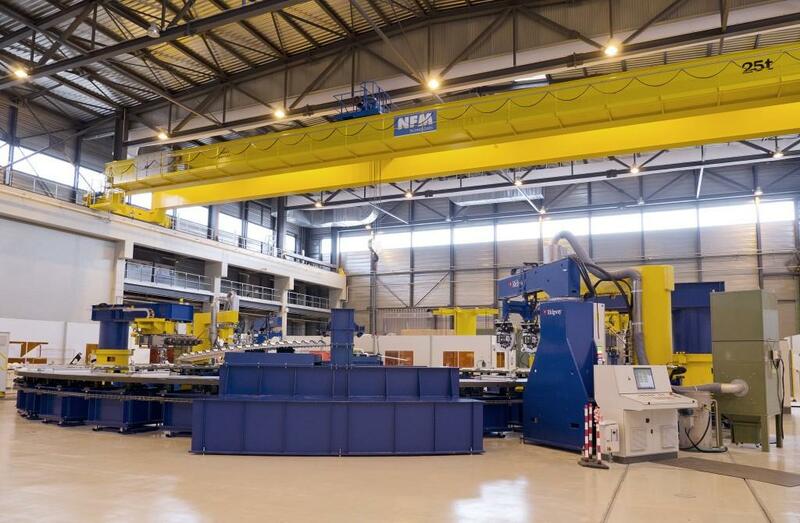 Qualification activities were successfully carried out to commission the winding and impregnation tooling stations. 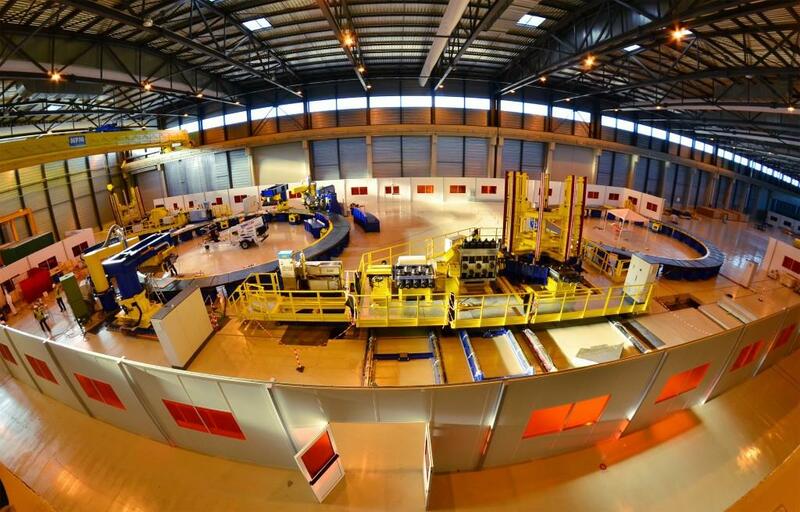 The first pre-dummy pancake—made with several turns of copper conductor instead of the real superconducting materials—was followed by the winding and impregnation of a full two-layer PF5 dummy double pancake. 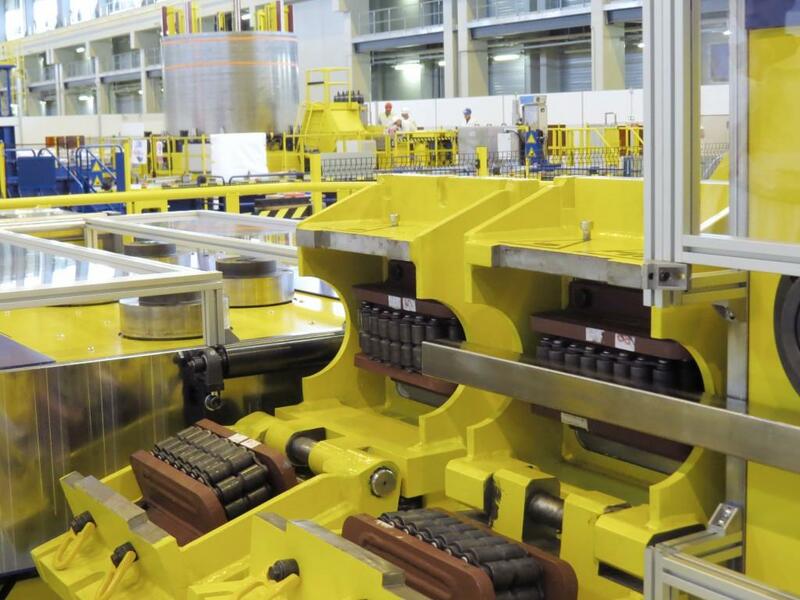 Now, series production is underway for the double pancakes—flat, spiralled coils that are stacked in up to eight layers to form the coil winding packs. 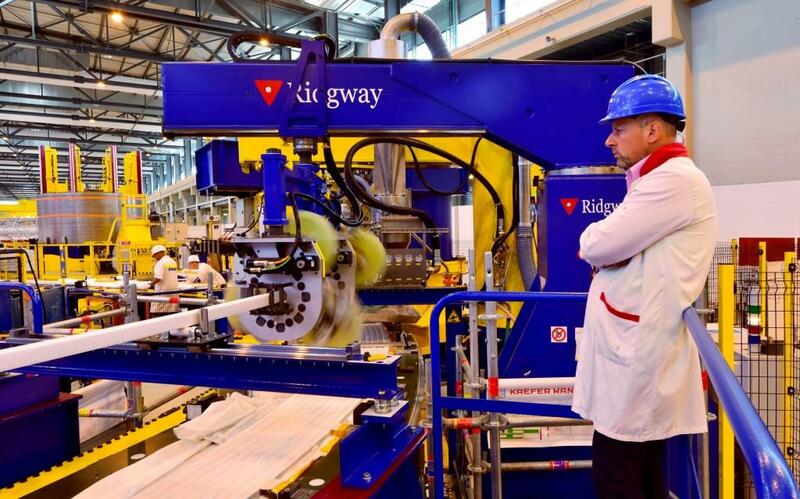 Thirty production double pancakes will be necessary for the four poloidal field coils that will be manufactured by European contractors on site. 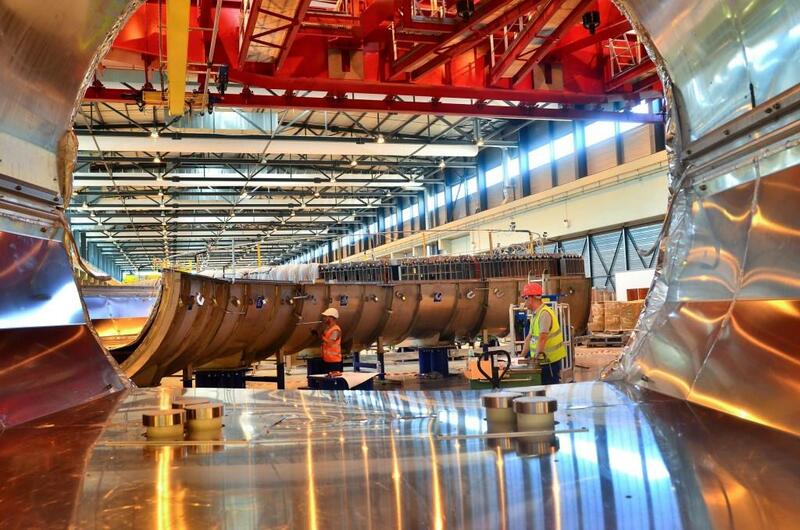 Fabrication will require at least 18 months per coil. The first coil, PF5, is in fabrication now. 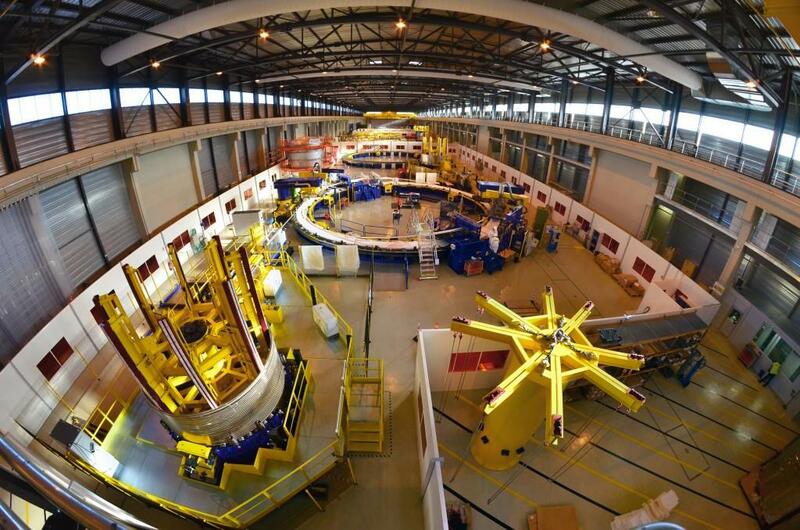 The raw material for the four coils—niobium-titanium (NbTi) cable-in-conduit superconductor—is produced in China and delivered to the Poloidal Field Coils Winding Facility on 20-tonne spools. 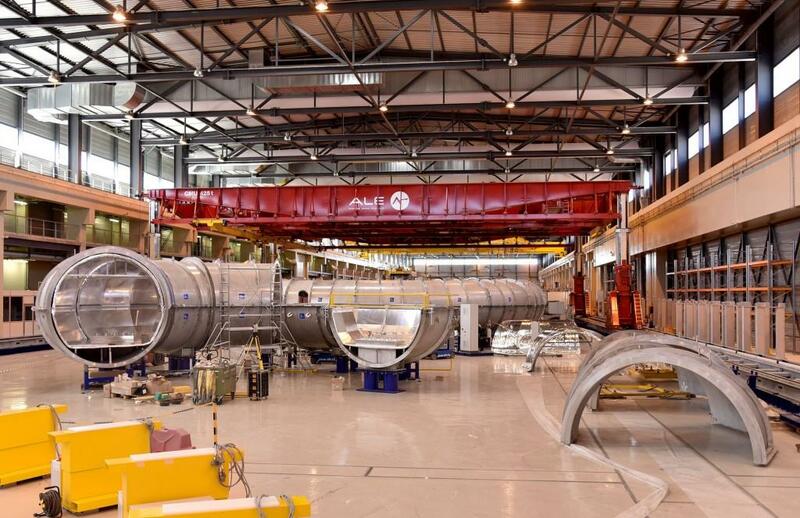 In the winding stage of fabrication, the conductor is uncoiled from the spools and straightened before passing through cleaning and sandblasting machines that prepare its surface to receive several layers of glass-fibre insulating tape. Rotating tape heads enter into action as the conductor, fed from two spools simultaneously, joins the tooling table to be "turned" into the precise dimensions required for each coil. 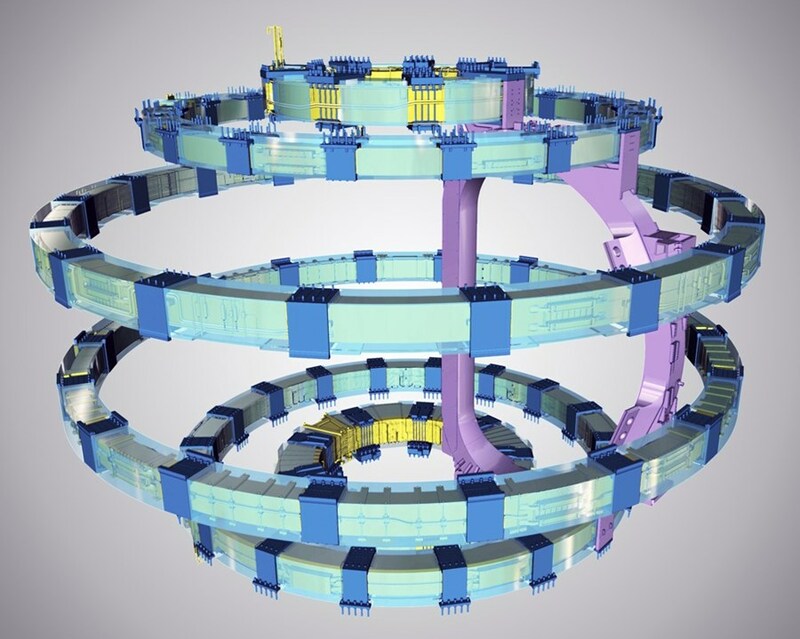 The resulting component is a spiralled, two-layer coil called a double pancake that weighs between 20 tonnes (PF2) and approximately 34 tonnes (PF3). 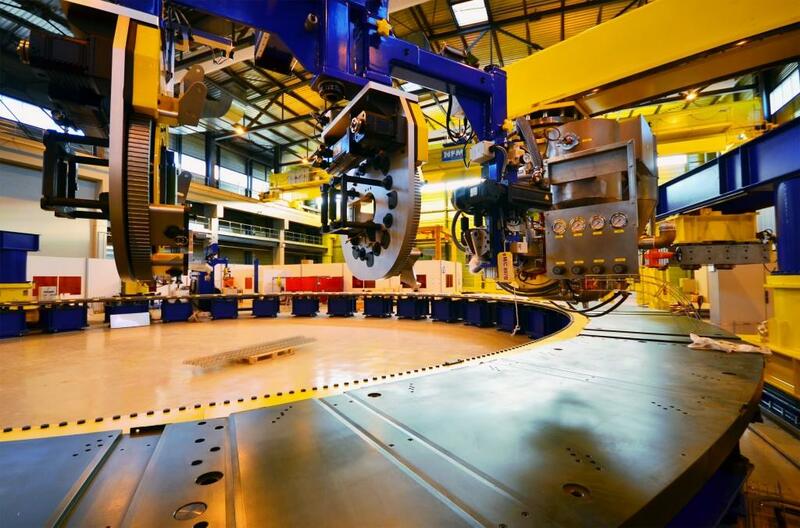 Next, the double pancake is transported by overhead crane to the vacuum pressure impregnation (VPI) station and lowered into a custom-fit mould. Epoxy resin, injected over the course of several hours, fills all gaps and hardens the glass tape under the effect of heat and pressure. A 36-hour "curing" phase at 140 °C completes the process, which gives the double pancake rigidity and ensures electrical insulation. 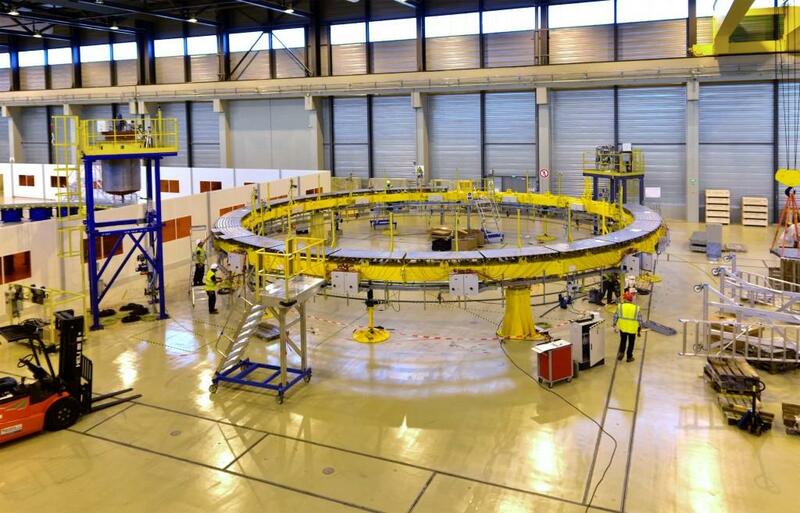 The rigid double pancake winding is transferred to the winding pack assembly area of the building where it is stacked with other double pancakes and joined together. 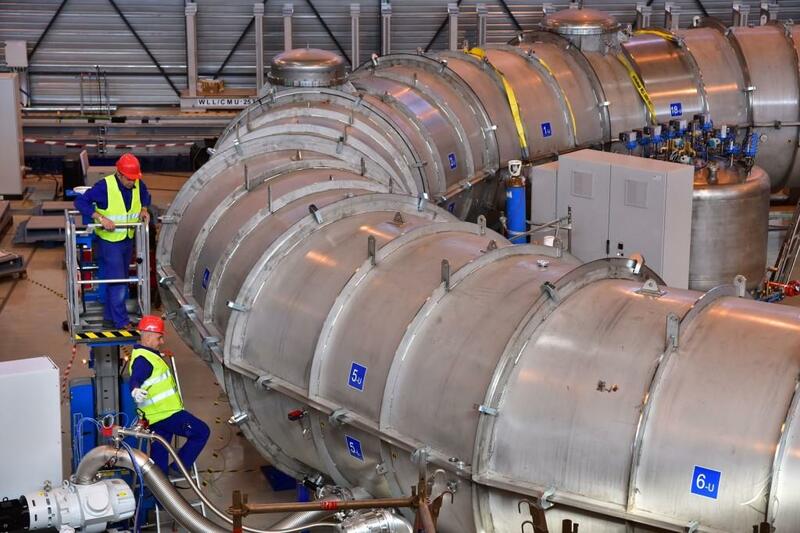 A second vacuum impregnation is performed to harden the entire assembly and components such as clamps, protection covers and helium pipes are added. 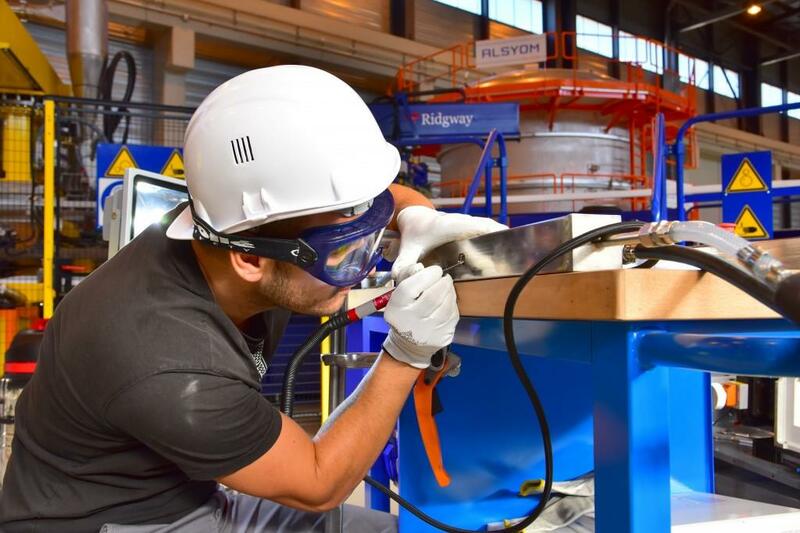 The final step is cold testing, during which the completed poloidal field coils will be cooled to low temperature (approximately 80 K) in order to simulate the thermal stresses and the work conditions that will be experienced during operation. 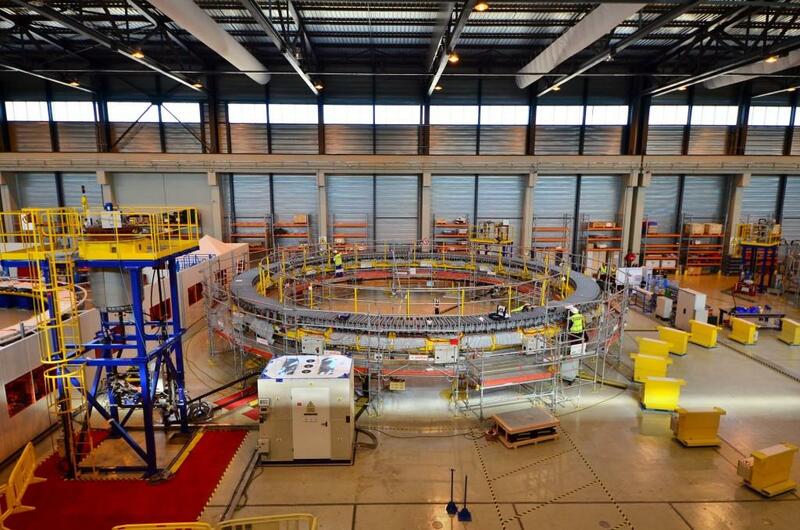 In this way, the performance of the coils will be tested before their installation in the ITER machine.